Is it possible to find a 4x4, a sporty car, a practical family hatchback and a load of technology in one package? 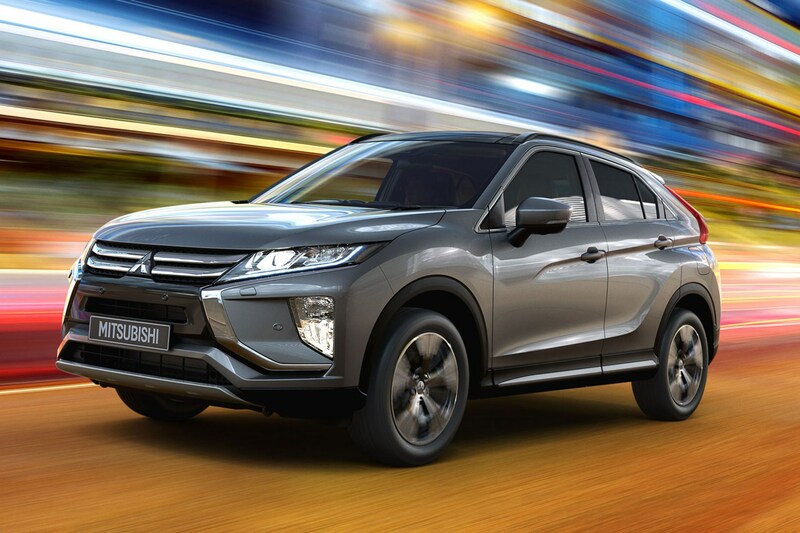 The Mitsubishi Eclipse Cross is yet another crossover candidate for families' hard-earned cash, offering high specification and all-wheel drive for a very compelling price. Is off-road credibility and dramatic styling enough to turn heads away from safe household name choices? 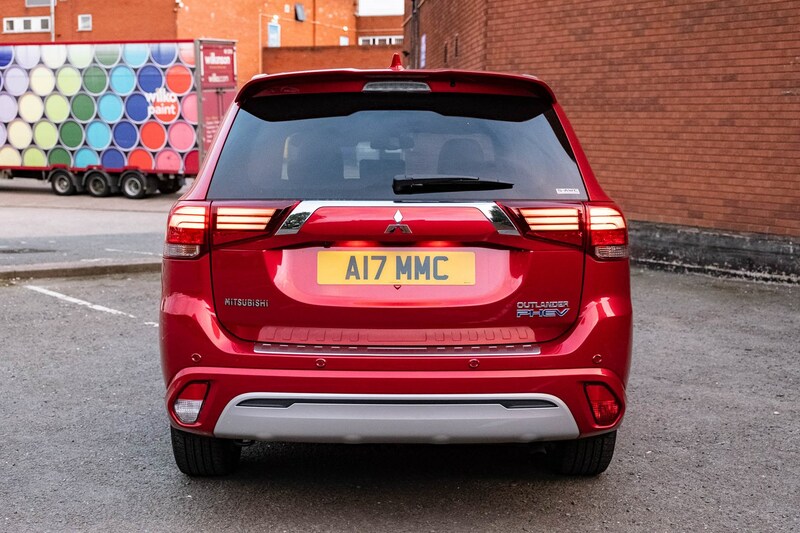 Mitsubishi's eclectic range of vehicles in the UK reflects a firm that has ventured in some relatively unusual directions over the years. Despite introducing pioneering technology in family cars, in the UK they're mostly now known for two highly capable 4x4s – the Shogun, and the L200 pickup. 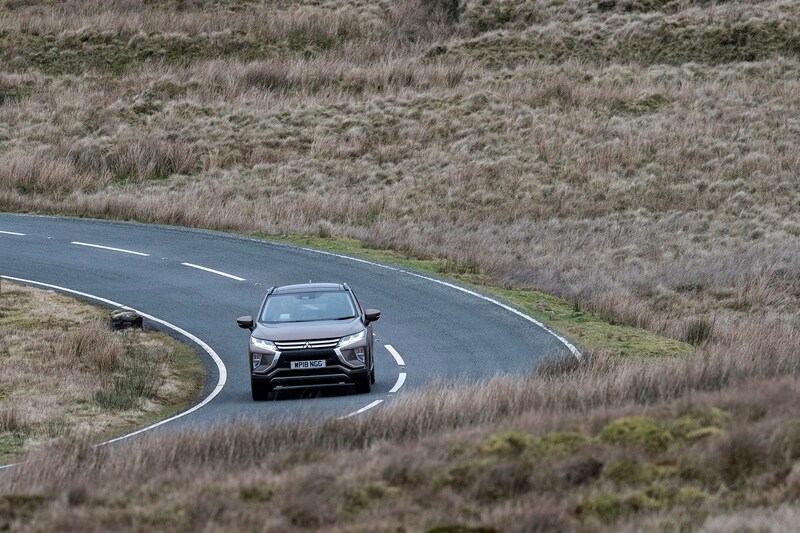 A focus on technology has helped the Outlander gain a lot of ground though, thanks to the company-car friendly PHEV. Turn your attention to the mainstream of hatchbacks and crossovers, and the marque is far from the first to leap to buyer's shortlists. Add the word Eclipse, and most people will think of Brian's neon-green coupé from The Fast and the Furious - a model that wasn't offered in the UK. Although Parkers' long-term test cars are just that – available across the team so we can all assess and review them in different circumstances – we generally run our assigned car daily, and this is my first opportunity to select and specify the car myself. 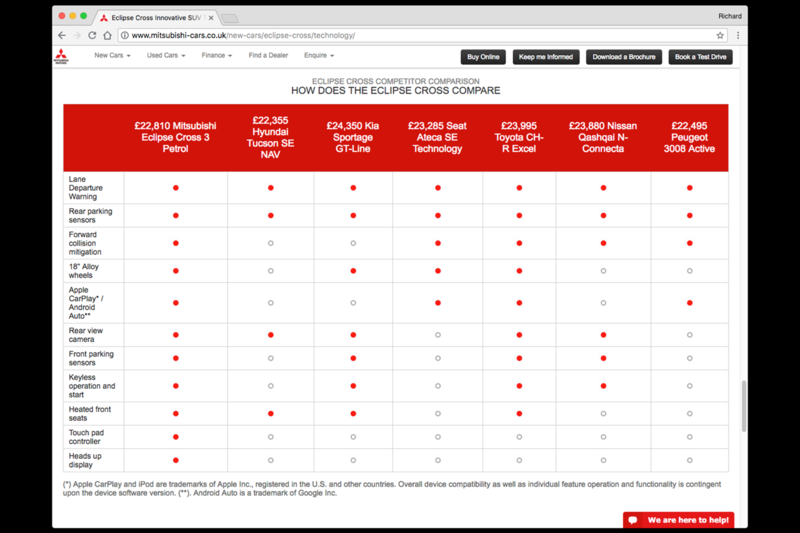 Why choose the Eclipse Cross? 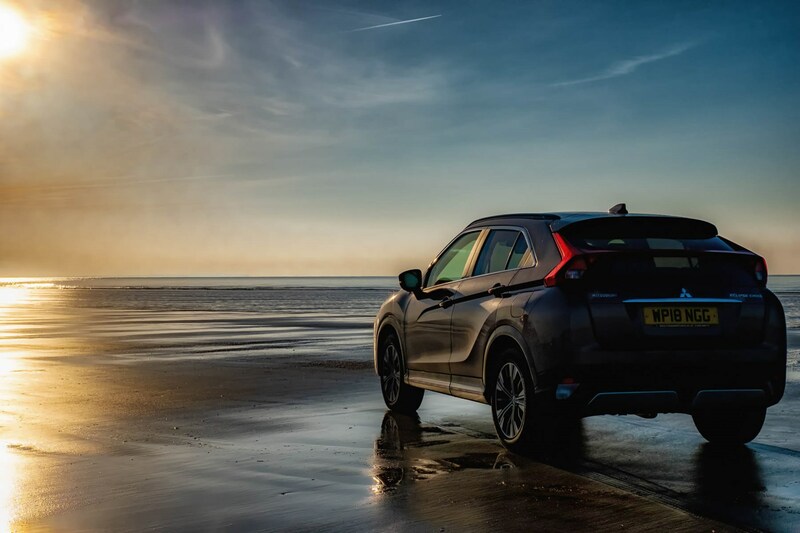 Crossovers are, frankly, the trendiest and fastest-growing sector – even if the best-seller lists don't show many in the top ten, there are so many different models it's notable that the Nissan Qashqai holds a consistent place in the top three. Yet personally, I've had little experience of them. Running a (Mitsubishi-based) Fiat Fullback pickup and a couple of classics, when choosing cars previously my tastes have been very focused on 'sporty' or 'practical'. If it has a roof, it's got to be a large estate car for long distances, 4x4 for rural and off-road driving, or a van-like MPV. The idea of something which isn't focused on one thing or the other seems alien, and yet – this compromise of hatchback footprint, off-road driving height and sporty looks is proving to be astoundingly popular with buyers all over the world. As one of the newest designs on the market – and perhaps, Mitsubishi's most credible attempt at the Juke/Qashqai's share – the Eclipse Cross is an obvious introduction to the genre. It appeals to me visually, with a modern yet conventional face and some intriguing intersections of design that recall French and American styles, and vitally it's available with an automatic transmission. There's only one engine though, and on paper, it's not what I'd choose to put into a 4x4 SUV. A 1.5-litre turbocharged four-cylinder unit, it's a new design, producing 163hp and 250Nm torque. Of course, these days small displacement, high efficiency petrol engines are commonplace. Did I mention Mitsubishi are known for pioneering technology? They've been here before, with the Colt CZT; in Ralliart form its 1.5-litre turbo produced 180hp in 2008 - and that was a much older engine design. 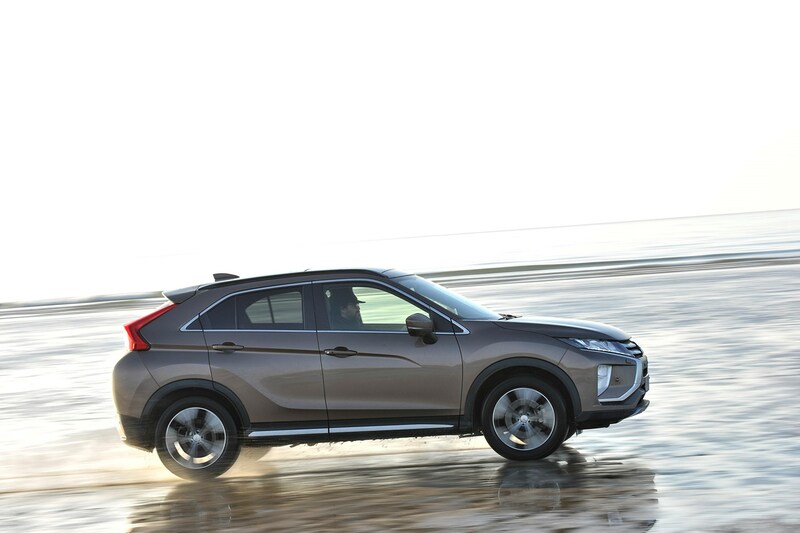 To get an automatic transmission model, it's necessary to go to the second specification level – Eclipse Cross 3 – though you can have that with front-wheel drive or four-wheel drive. We've gone for the top of the range Cross 4, though, with a list price of £28,165, plus metallic paint at £540. It features leather seats, upgraded Rockford Fosgate audio, a panoramic sunroof, and adaptive cruise control. A fairly limited colour selection leads to the only one likely to stand out in our fleet... New Bronze. Over the next six months we'll explore the ability and identity of the Eclipse Cross – will this Mitsubishi crossover encourage you to cross over? After a couple of weeks with the Eclipse, the first thing that comes to mind is that the mental trick where you keep seeing your own type of car hasn't happened. There are a couple of Eclipse Crosses around the business park here, but I've yet to see another one on the road; a degree of exclusivity? It's not an anonymous car, though. So many crossovers have homogenous styling that that it's hard to see where the brand identity is. Mitsubishi hasn't exactly shattered the mould here, either, but there are some recognisable features at least. It isn't Juke-esque cartoony and exaggerated, or cute like the Kia Sportage, but still falls short of being well proportioned from all angles, and the initial aggression of the front and upper half gets lost elsewhere. Drivers glancing in their rearview mirror will see a traditional large headlight 'face', with a solid two-bar grille and bold diamond logo. 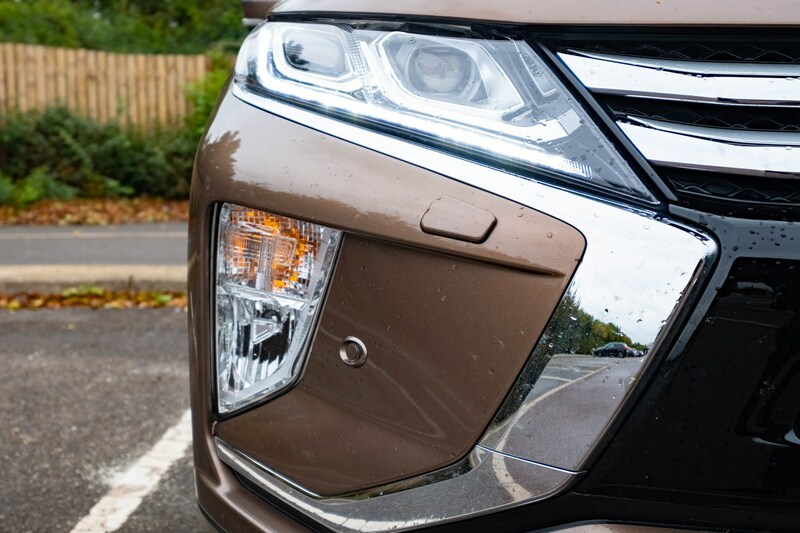 Inside the headlights, an unambitious day running light design is picked out in delicate icicles that sparkle rather than glow, and the front of the car is dominated by Mitsubishi's 'Dynamic Shield' motif in chrome. Unusually, the headlights appear to have two lenses yet have a single projector lens for low and high beams, and the unmissable foglights are in the bumper. If there's a function to the outer rectangular lens in the light, I've yet to find it. 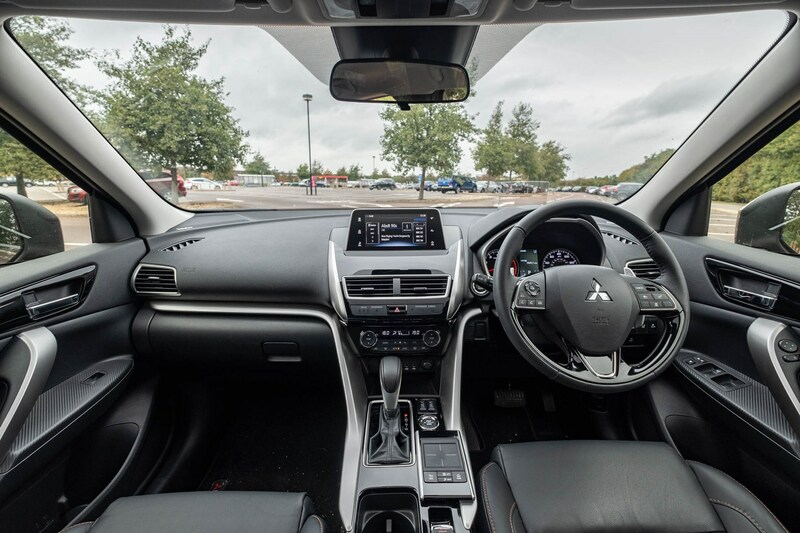 Although the Eclipse Cross is a new design, this shape is not replicated as many times in the whole car as it is on other Mitsubishi models; the steering wheel is closer to that found in older L200s than the newest style for example. Some replication of shapes does take place, as the usefully large door mirrors echo the front wheel arches with a cat-eye glasses aesthetic. 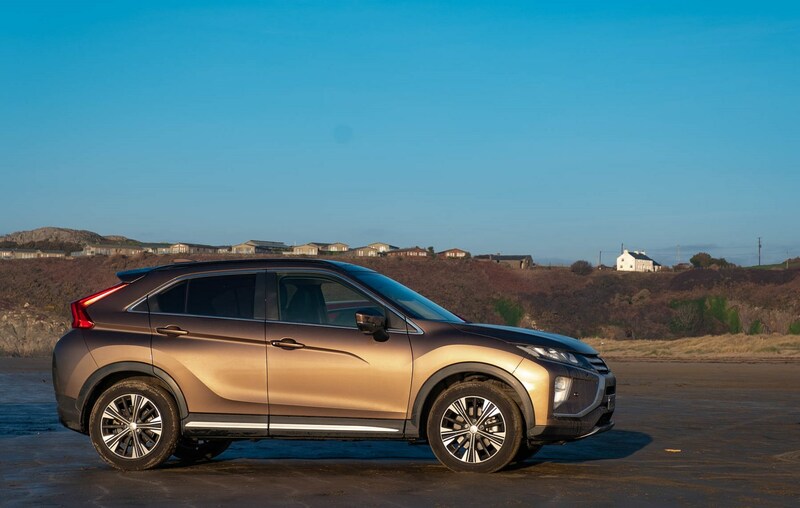 Overall, though, the Eclipse Cross deploys an eclectic mix of curves and lines to blend a coupe-inspired hatchback upper half and scaled-down off roader lower look. 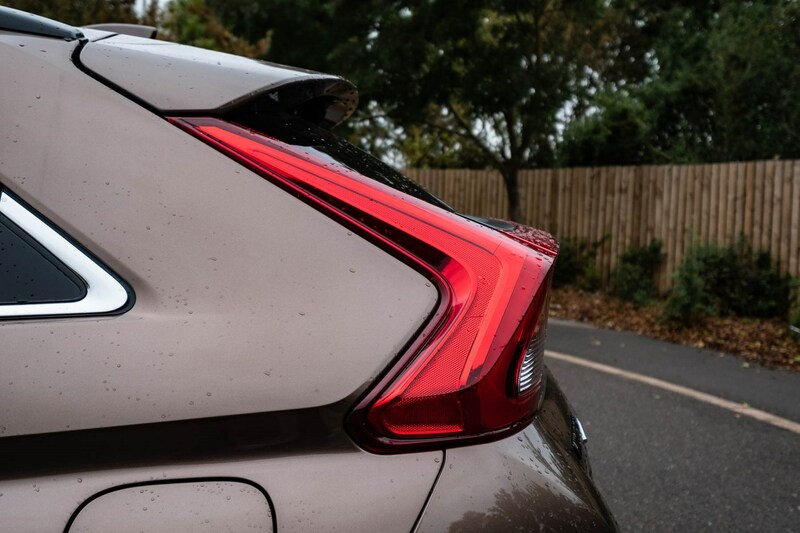 The wide, split rear window and bold angular taillights sit atop a gently curved bum(per); people look for human shapes in their designs and this baby's got back; the same rounded rear theme can be found on the Shogun Sport. A sharp diagonal swathe sliced from the flank runs from tail to door, mirrored on the lower half of the car to promote a very real wedge shape; the windows plunge towards the front wheel resulting in a wide view up front, but a rather claustrophobic rear. 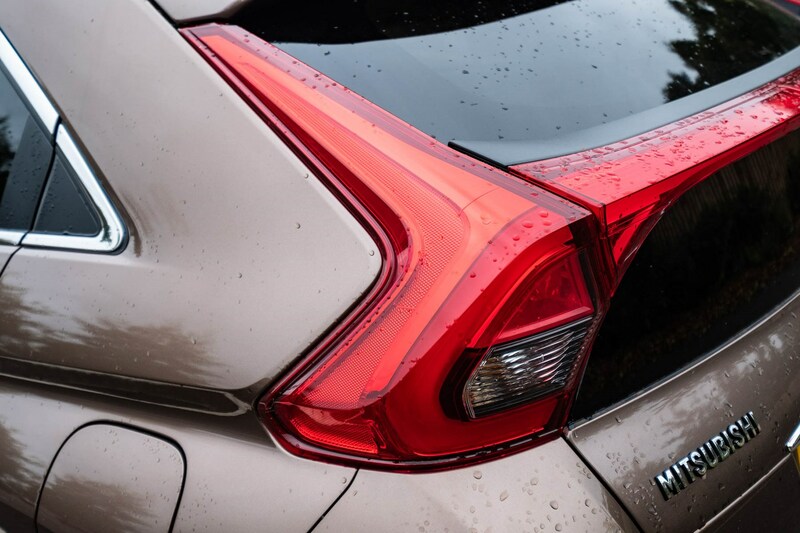 From behind, the Eclipse Cross reveals that 'sports car' look is more like two cars stacked – with a tail light design that any American designer of the 1980s would be proud of, forming a near-continuous line when the brakes are applied. It also forms a spoiler - hidden in the design is the shape of a Lancer Evo X wing against the back window. Below the dark glass and angular lights, the rounded metalwork looks a bit out of place, but it's a useful design functionally - the boot aperture is wide and not too high up and the split rear window is easy to see out of while often blocking the lights of cars following. 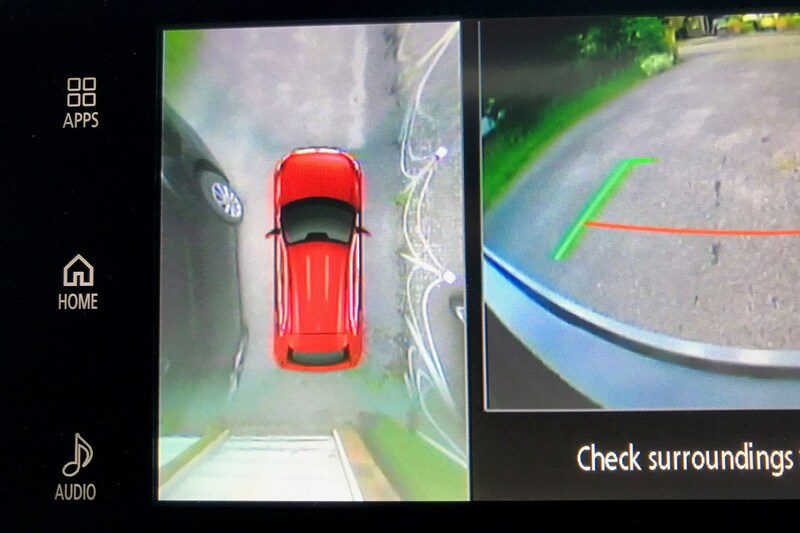 There are some neat details too, like the cleverly hidden rear wiper and a glimpse of red in the rear view mirror from the dart-light tail lights. All of the sculpting is flattered by the New Bronze (or, brown metallic) paintwork, which provides a contrasting base for the chrome and lighting details without the weight of pearlescent black (which unless perfectly clean, also masks the contrasting plastic scuff plates and arches) or blandness of the otherwise handsome silver and grey. 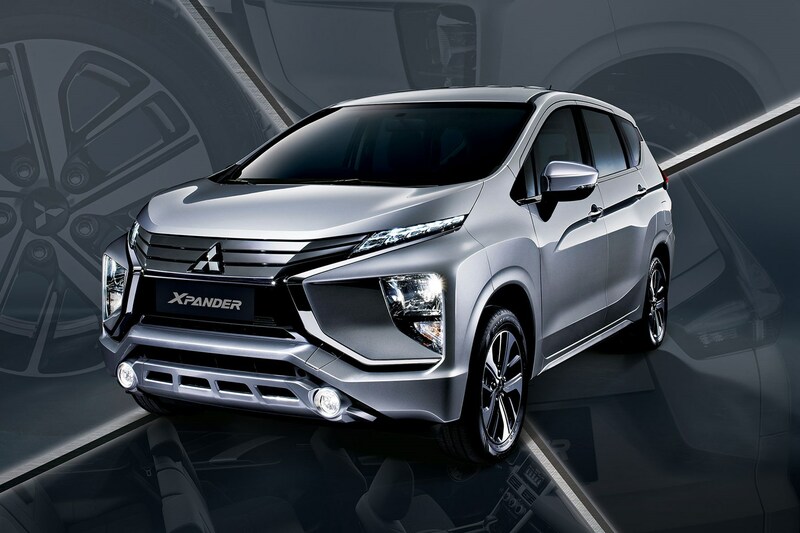 Within the UK range the Eclipse Cross looks a bit odd, but it does have a family theme for the global market – in Indonesia (and other markets in the region) – the Mitsubishi Xpander is a seven-seater relative that throws the context of the Eclipse Cross into sharp relief. This is the time-honoured sporty companion to a standard family car, 2018 style. Drop some ground clearance and the Eclipse Cross would be a family hatchback - does the interior space justify the size? What's the Mitsubishi Eclipse Cross like inside? 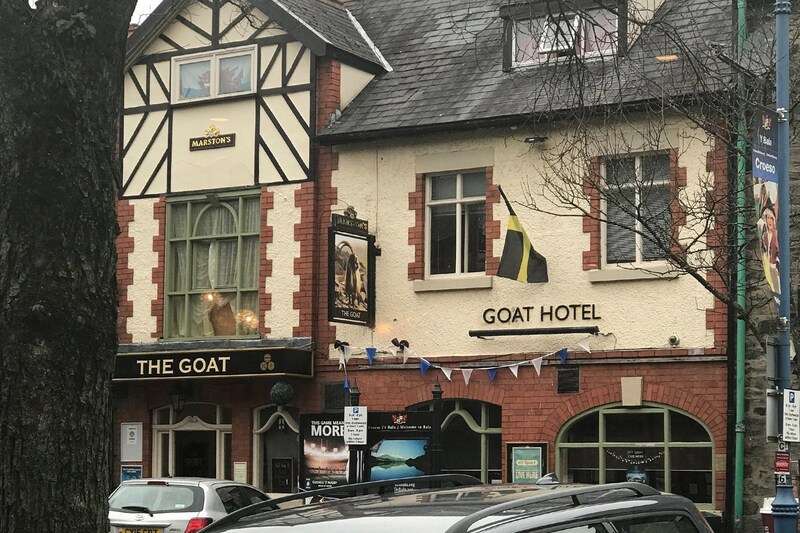 Rather less adventurous than the exterior. 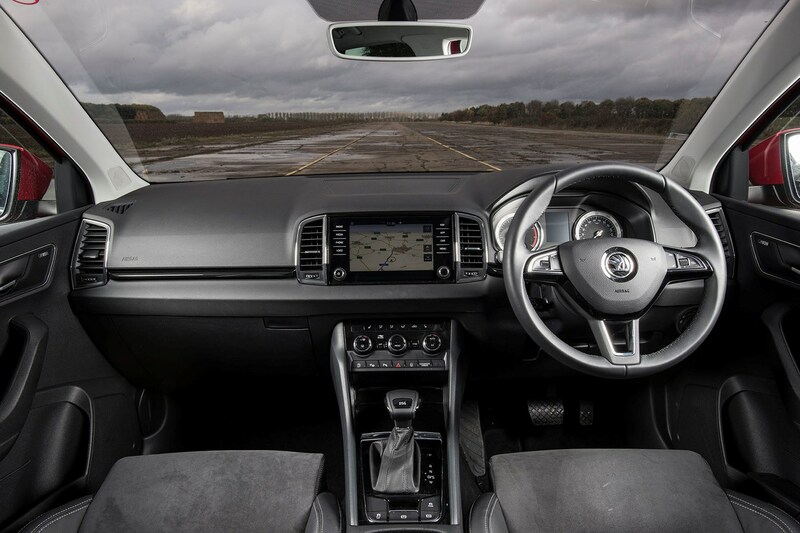 The dashboard features a curved line to bring the door trims and sides of the car up to the windscreen, and a relatively unfussy symmetrical dashboard topped by a surprisingly small-looking 7.0-inch touchscreen. 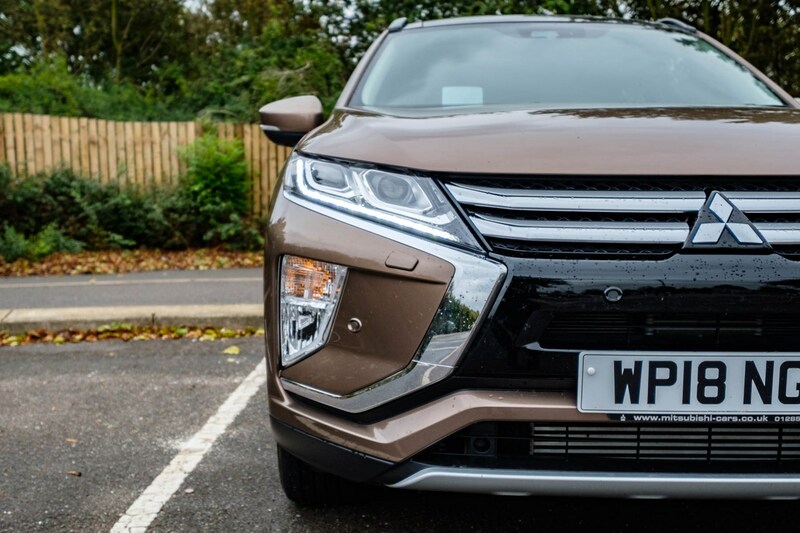 It's pleasing, but far from avant-garde boldness, and the materials tend towards the functional - though that feeling is partly influenced by the near-£30,000 price of the top of the range Eclipse Cross 4. It's where many rivals are starting to include stitched leather-effect dashboard trim; even at the entry level, Peugeot make the 3008 more interesting in tactile terms. Crucially, the lack of challenging design means it's extremely easy to live with and use. 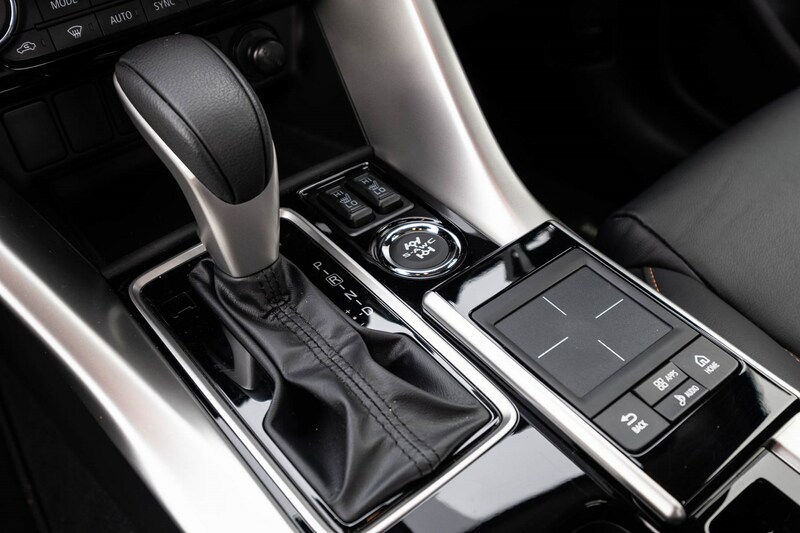 Controls fall easily to hand, with the possible exception of the driver aid buttons that, like many Japanese cars, are clustered by the right knee and obscured in everyday driving. 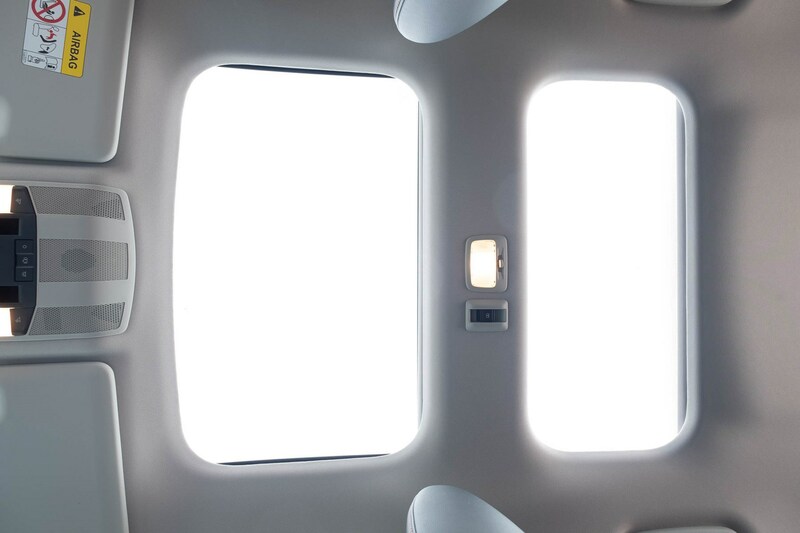 The roof console includes a control for the front sunblind, but you'll have to reach overhead to open the back. Like almost every car made these days, there's a USB port to connect the smartphone - easily accessed below the heater controls - and, also like almost every car made these days, there's nowhere truly sensible to store the aforementioned device without trailing cables all over the centre console. There's a cable cutout to drop the phone in the commodious box between the seats, but why the USB port isn't in there as well is somewhat baffling. That mainstay of lifting base-spec interiors, piano black, is rampant in areas where it can attract as many fingerprints and specks of dust as possible. Dust Is clearly anticipated, as the Eclipse Cross 4 comes with a head up display that hides under a motorised cover. Leather-trimmed seats with orange stitching are reminiscent of the L200 SVP II, and are pretty comfortable. Up front there's plenty of room and reasonable adjustment for the driver, though the seats are fairly flat and simple overall. 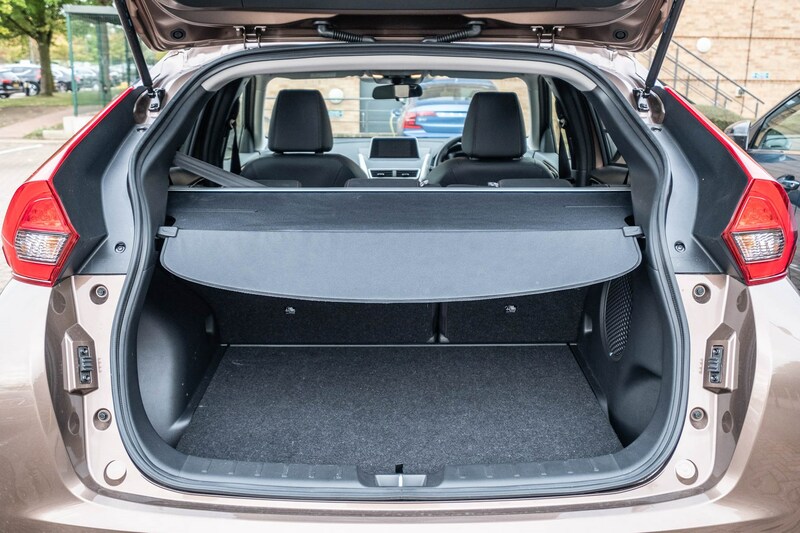 It gets more interesting in the back - as the boot space/rear legroom balance can be adjusted by sliding the seats in a 60/40 split, and the back can be latched at different angles with the retractable load cover repositioned accordingly. 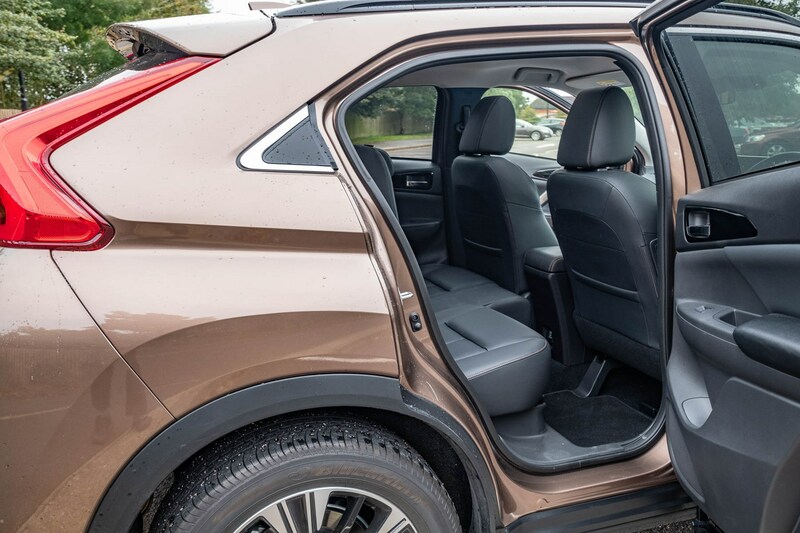 A real advantage for families, the Eclipse Cross rear door apertures are tall and kick back a little at head height, rather than intruding. 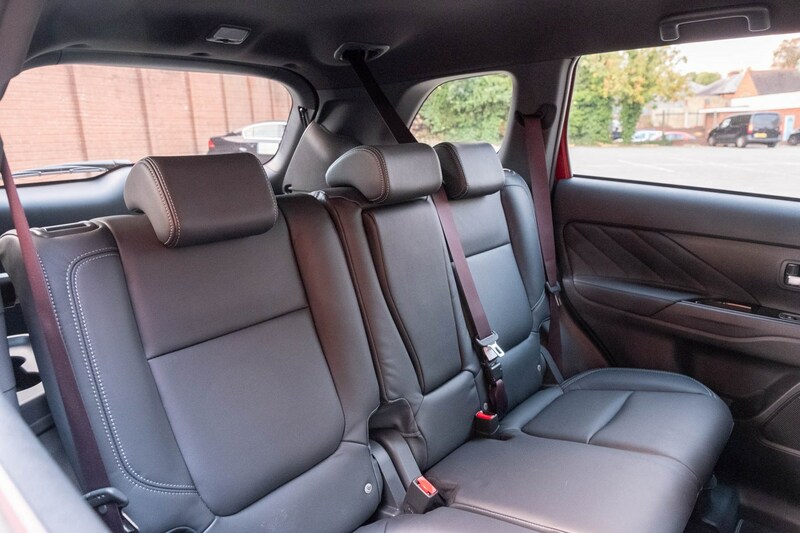 Rear seat passengers don't just enjoy more space. 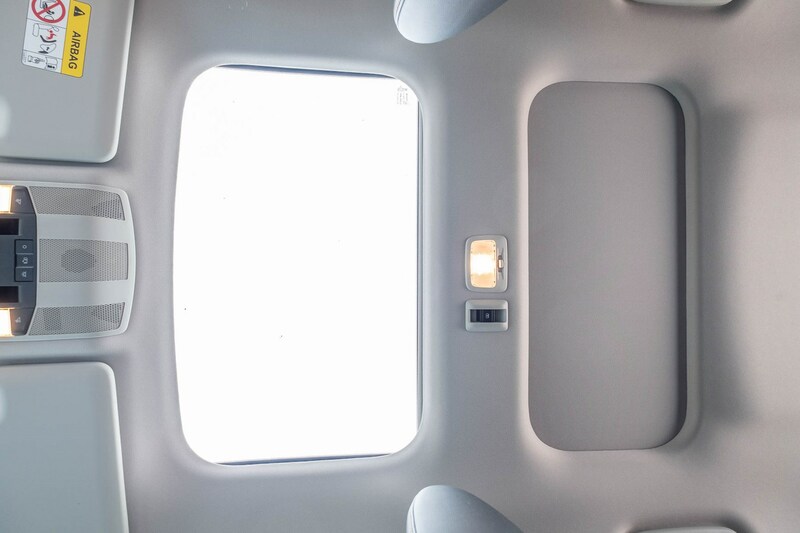 With their own panoramic roof blind, and rear windows that open a decent way into the door, the Eclipse Cross will win the hearts of your kids before it's won you over. The centre seat is a little irritating to use - predictably, as the sliding/folding back seats necessitate one of those fiddly roof-mounted seatbelts in addition to the lack of sculpting and support. Heavier objects also seem to mark the leather incredibly easily. There is one downside to the glazed roof. 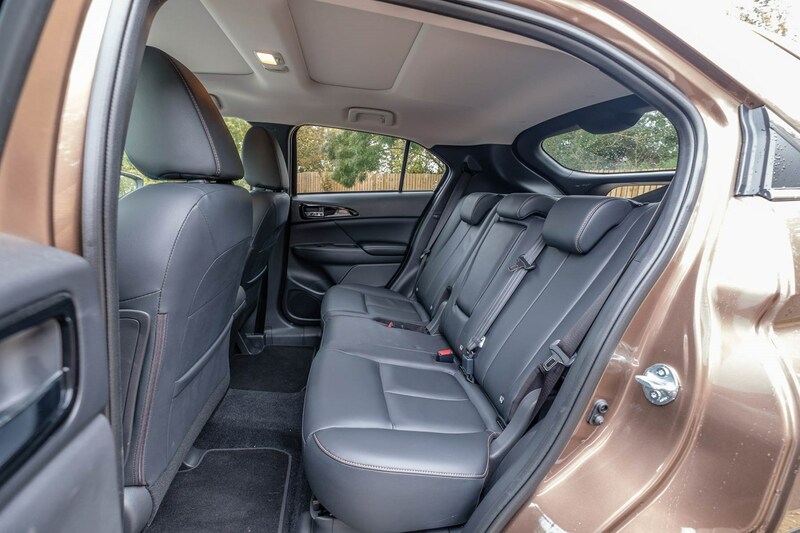 Headroom is reduced a surprising amount, and taller adults will find the back seats less comfortable. 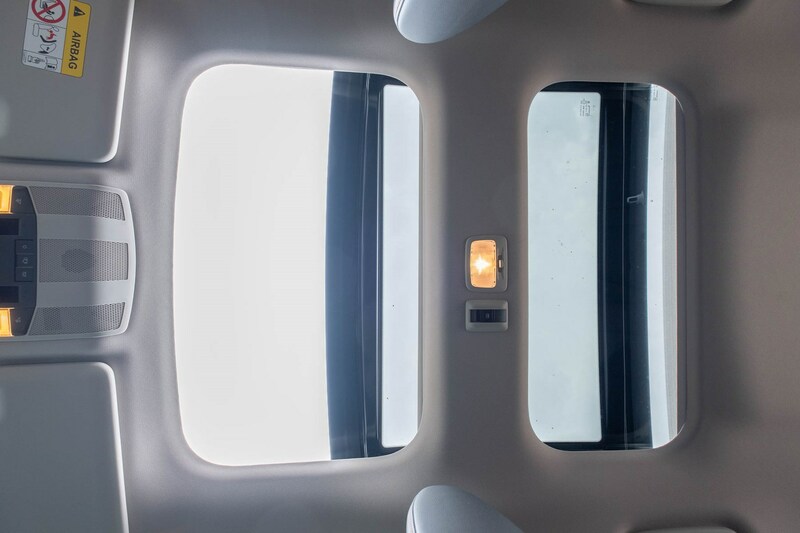 The rear headrests also intrude somewhat - either on the shoulders of passengers, or the view for the driver. There are bigger crossovers, and different solutions for utilising space in a car of this length, but the Eclipse Cross achieves an impressive balance for the real world - while remaining visually interesting. 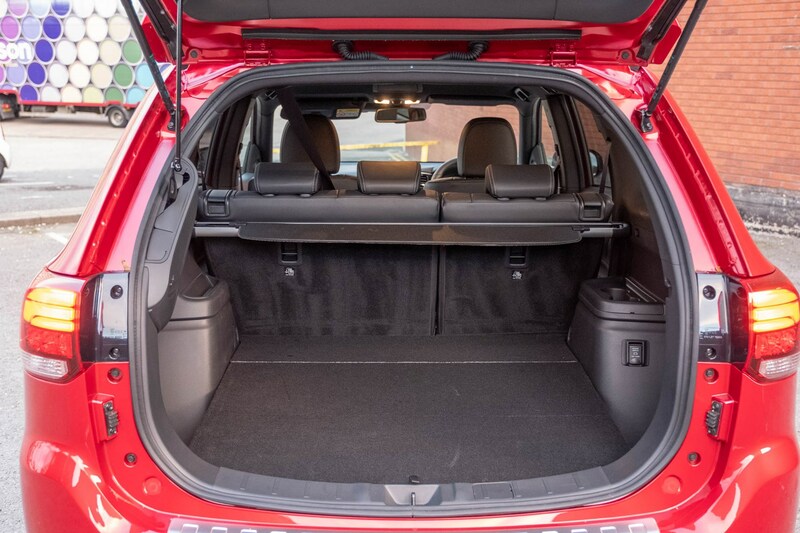 Clever touches, like storage for the parcel shelf below the load floor, complete the useful nature of this compact Mitsubishi; regardless of your opinion of SUVs over normal hatchbacks as the right solution for families, this crossover succeeds at meeting most needs well. Perhaps most impressive, though, is that despite the relentless tedium of the commute and a rather unforgiving summer making the climate control work extra hard, the Eclipse Cross is achieving 90% of claimed economy without any special effort made. It's not marketed with economy as a leading feature, and that's okay - buyers can manage their expectations. Unlike those that claim impressive figures while only returning 60% of those claimed in the real world, Mitsubishi seem to have got their numbers right. We take a trip to see a lunar event, and are thwarted. No Eclipse. Cross. 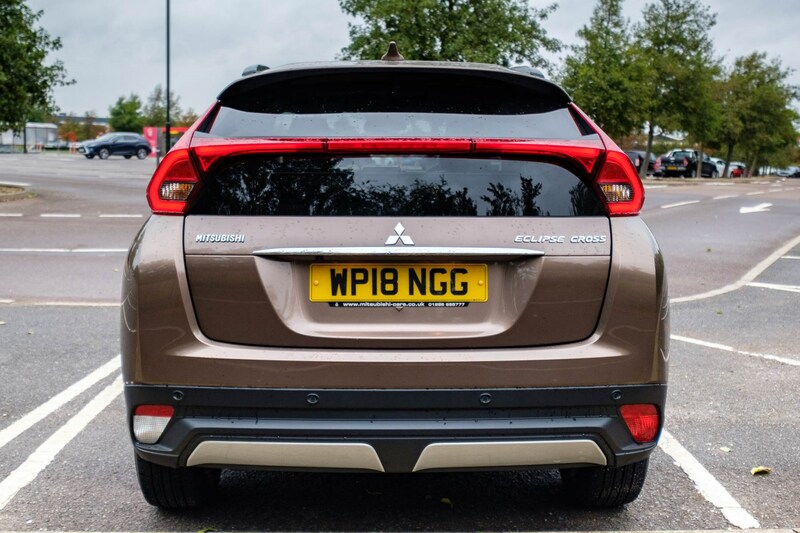 By now we're probably all on the same page understanding what the Eclipse Cross is – so no more analysing; a couple of thousand miles have been covered, which is more than enough time to judge how the Mitsubishi performs in the real world. 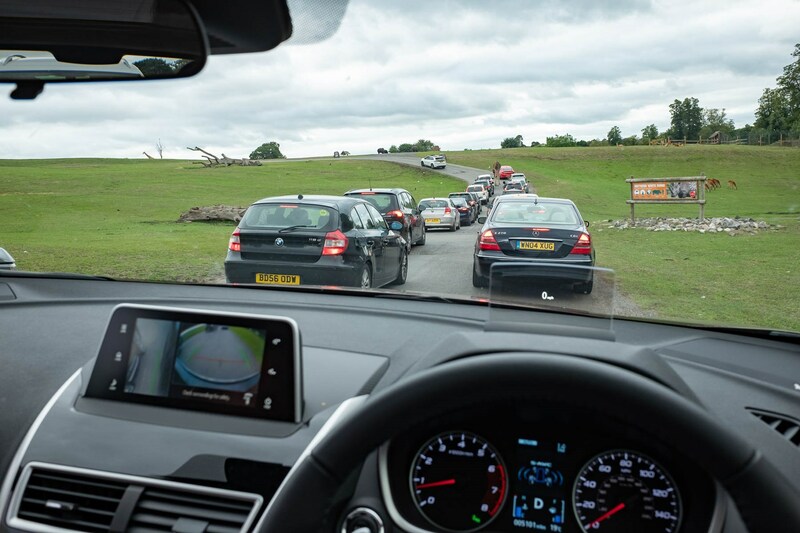 We've even taken time to get out and about in leisure time – and this would have been a lovely update about the lunar eclipse, with pictures taken on Shropshire hills and a blood red moon echoed in the car's badges. You'll have to imagine it, though, as the weather refused to play ball – despite planning and looking to see where might offer the best view, a lengthy country journey on winding roads around Clent and Kidderminster yielded nothing but relentless, unyielding cumulonimbus. Obscured by Clouds, then, we pointed the car back to Warwickshire and the evening delights of The Orange Tree's beer garden – where countless other disappointed people stared at the flat grey sky. Still – it was a change from the M6 and A14, and a chance to enjoy the Eclipse's road manners with a few bends thrown in. Adjust the seat and mirrors, tweak the head-up display position, and press the start button to the left of the steering wheel – and the surprisingly quiet 1.5-litre engine whirrs into life. Underneath the floor lurks a platform that shares technology with the World Rally Championshi-bred Lancer Evo and larger SUVs from the Japanese firm. 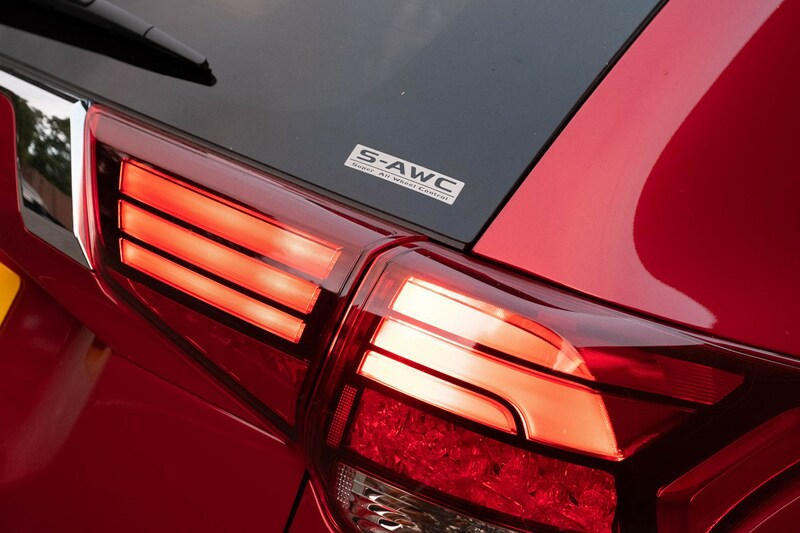 It's summer, and the button that selects 'snow' mode is still frustratingly redundant until some weather happens, but no matter – the S-AWC all-wheel drive system works in all conditions, and is ready to provide grip when needed. Most drivers won't feel they're losing out by going for the front-wheel drive model, to be fair. The chassis is set up for safe, measured progress. I'm impressed with the 4x4 system on the road, though - slide the gearbox into drive, prod the throttle, and the tall car moves off the line with a brisk calmness until you reach the first corner, at which point the long-travel suspension and tall stance remind you that body roll is real. Hang in there, and it all comes together. CVT - is it the gearbox that completes the Eclipse Cross? I haven't driven a manual version, so can't speak for the effectiveness of the engine when the driver's really choosing the ratios. Connected to the clever CVT however, it can be kept at peak efficiency or peak power as required - or you can pull the paddle shifters and jump between eight preset ratios. I've yet to find any reason to do so – the gearbox is seamless and efficient. Forget accelerating in a series of bursts; the Eclipse Cross builds speed progressively with little drama. Go into a corner expecting to zip around like the best hot-hatchbacks though, and suddenly the S-AWC system comes to life. A system called 'Active Yaw Control' tidies a scruffy attempt and keeps it all safe, but until you're used to the body movement it can feel a little unusual. 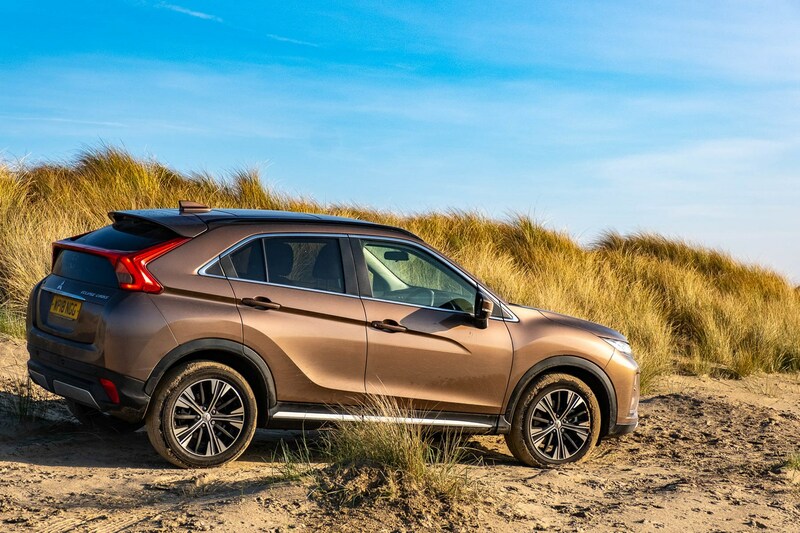 After a few miles, the Eclipse Cross can be driven swiftly, safely and in comfort – it's inherently stable. In the wet it gets better, with impressive grip when going grille-to-grille against Britain's most belligerent rush-hour warriors. 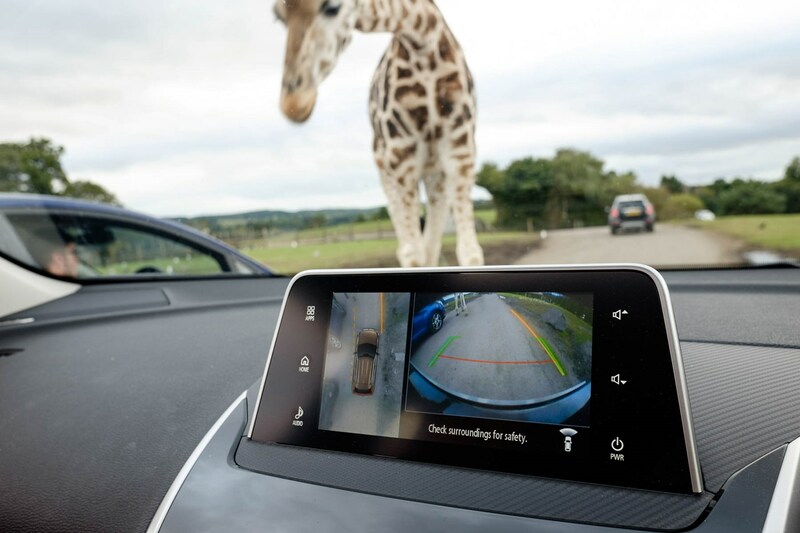 High-speed roundabouts can be tackled in confidence; for even more security the 360 degree camera system will display the nearside kerb at normal speeds, and the front overhang at parking pace. Much of the handling prowess and agility is wasted on me, at least at the moment. 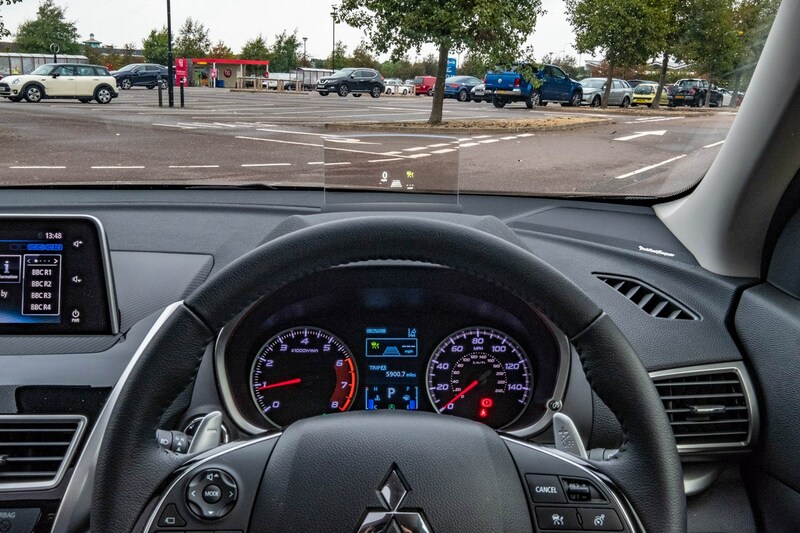 Commuting daily from Birmingham to Peterborough, there are other aspects of the Eclipse Cross that are far more valuable, frankly; the adaptive cruise control and head-up display in particular. 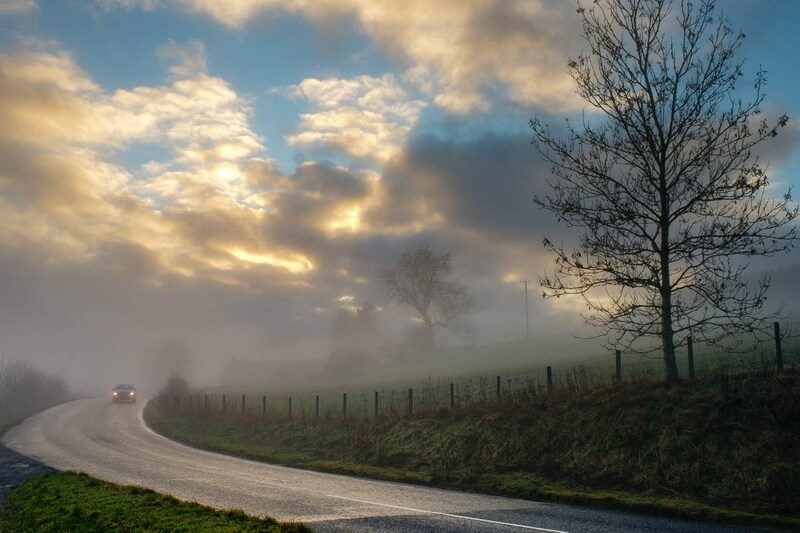 Fortunately for my sanity, there's a short stretch of country road where actually steering the car can be enjoyed, though, and if you're fortunate enough to live in somewhere like the Scottish Borders, or much of Wales, this is a brilliant little thing – winter safety and summer fun combined. Update 5: High Hopes - Will the Eclipse Cross PHEV be better than the Outlander? 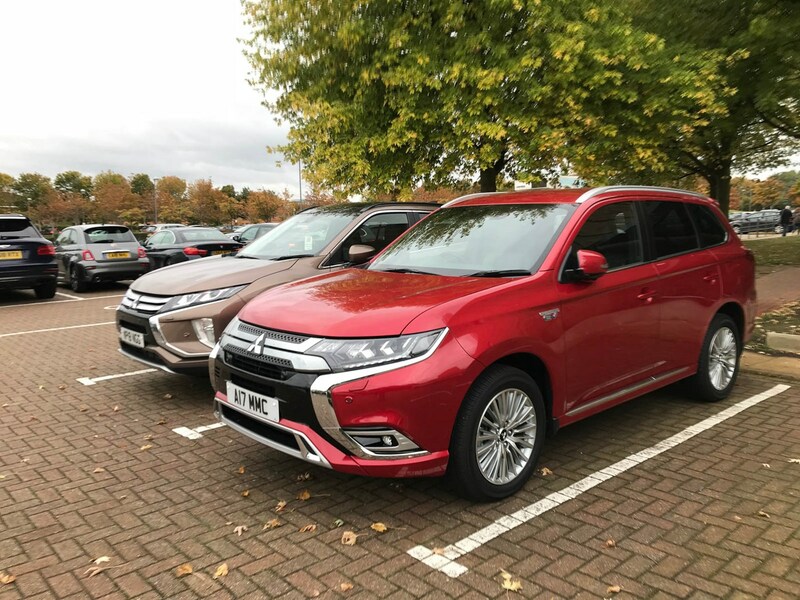 Mitsubishi's PHEV technology demonstrates hope for the future of driving; is the Outlander really the best showcase, though? 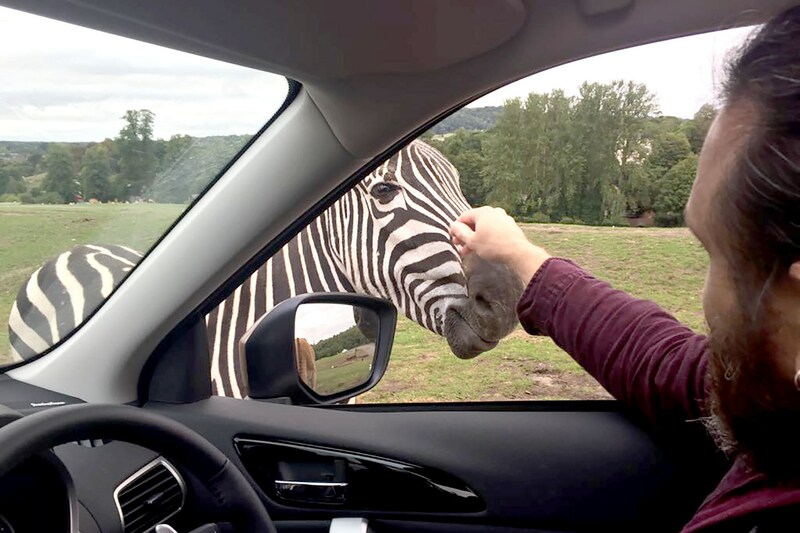 Testing cars naturally means swapping out of the regular long-termer and into something else on occasion, and usually it’s something very different – from a Ford Mustang, to a Mercedes-AMG G 63, to a Skoda Superb; many different cars have graced the driveway at home while the brown car goes on adventures with someone else on the team. 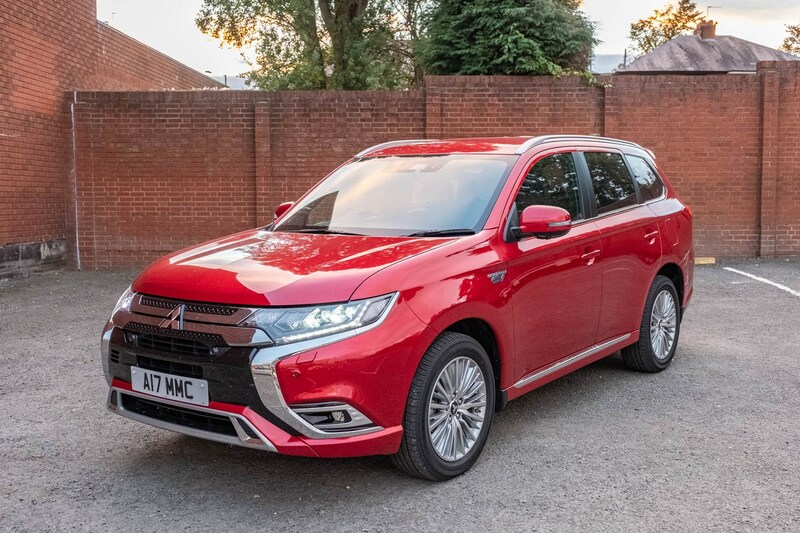 This time, though, the differences are outweighed by similarities – the stand-in vehicle is a Mitsubishi Outlander PHEV, in 2018’s refreshed and WLTP-friendly specification. 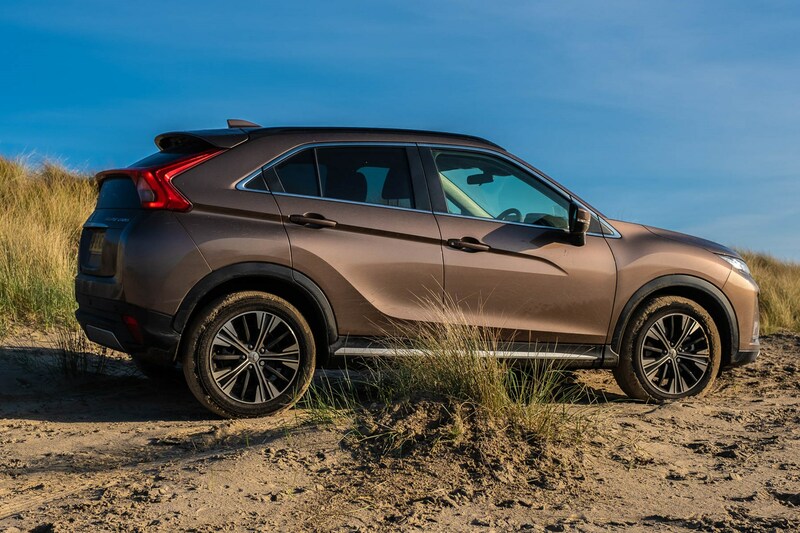 Despite the very different styling, under the body is a platform closely related to the Eclipse Cross; the worldwide ‘Mitsubishi GS’ underpinnings that have carried everything from sporty coupes to American off-roaders and MPVs. 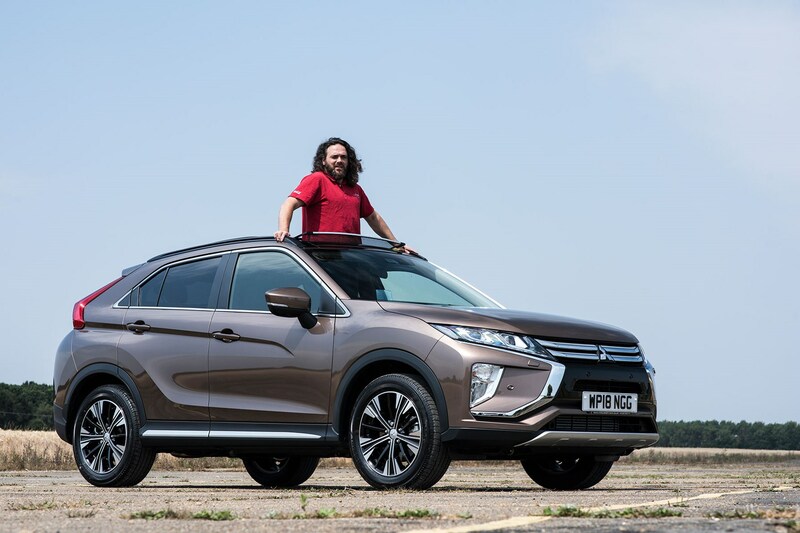 Tying the Outlander and Eclipse Cross roots together is even easier than platform knowledge – starting with the wheelbase, which is 2.67m on both (and on the ASX). The 1.54m track is also identical; the potential for shared components under the skin is huge. 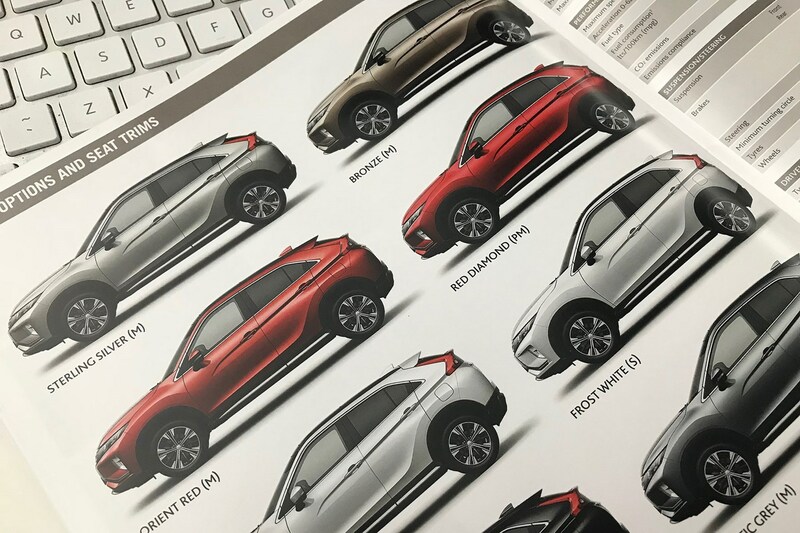 Scan the ‘hard points’ of body design, such as pillar dimensions and bulkhead construction, and it’s clear that the Eclipse Cross and Outlander are cut from the same cloth. 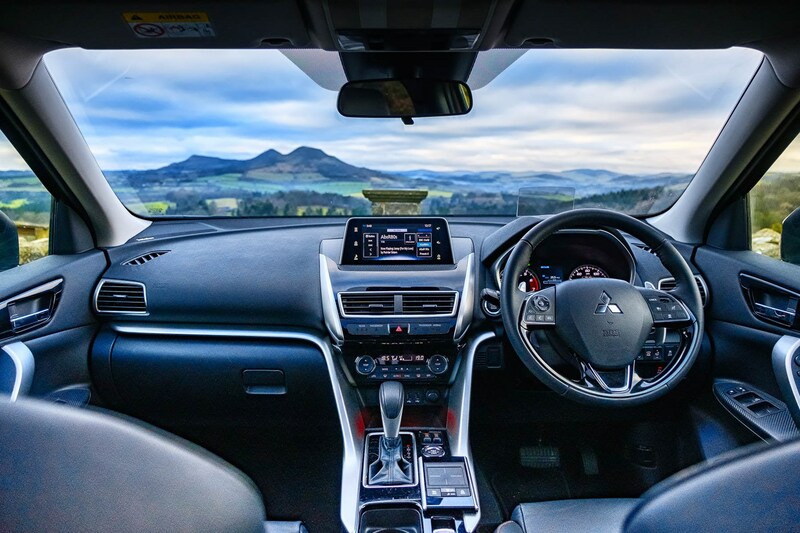 Yet they couldn’t be more different in attitude – the Outlander’s staid, functional dashboard being the driver-focused face of sensibility disguising a sophisticated plug-in hybrid powertrain, where the Eclipse Cross screams modernity and youth appeal around the purely petrol powered motor. 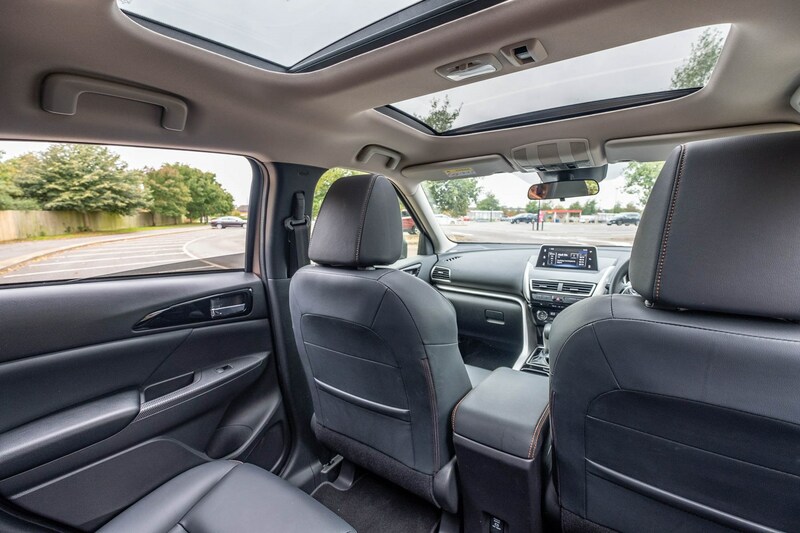 Inside, the Outlander feels less snug, with a wide centre console and tall rear seating area. Some models even come with seven seats; wheelbase aside, the Outlander’s a good 4.69m long vs. the Eclipse’s 4.4m, before you’ve considered the more upright tailgate and windows. 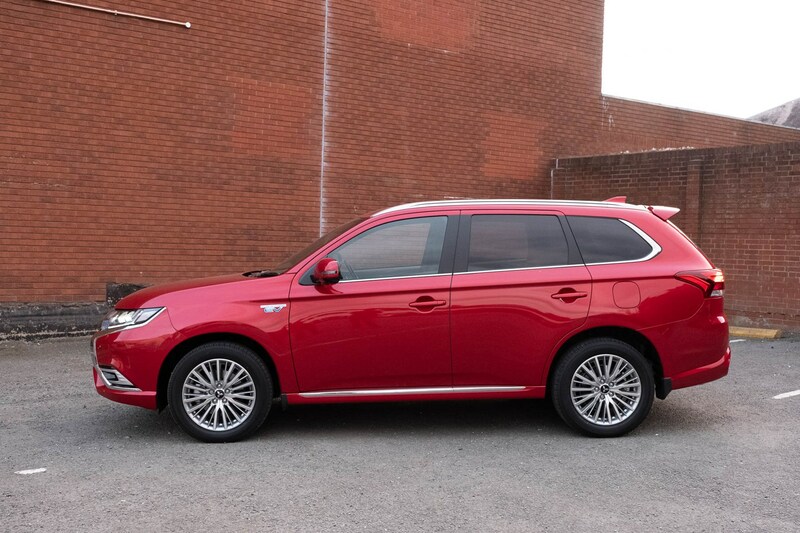 In PHEV form the Outlander's running gear really is at odds with the appearance. It is an older car – the core of the styling dates back to 2012 – and was quite conservative when launched. 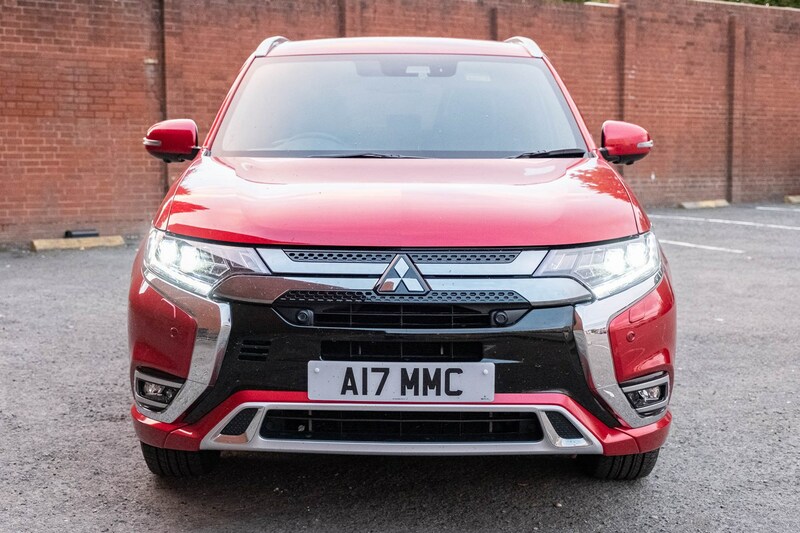 It is also the UK’s most popular alternative fuel vehicle – and Mitsubishi has high hopes of it gaining even more market share with the latest updates. 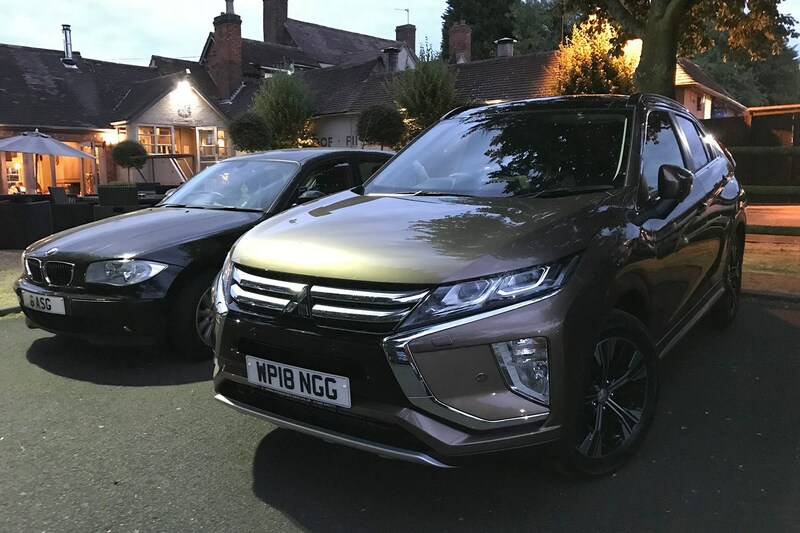 Don't try this at home - but if you blindfolded a passenger and took them for a drive in the Outlander (yes, it also smells similar and has similar seats to the Eclipse Cross), then showed them both cars they would almost certainly say they’d been driven in the funky Eclipse – such is the alien, yet beautifully executed way in which the PHEV goes about town. A gentle, stepped whirring of pulse-width modulated power is like a scaled-down city train, the illusion enhanced by the petrol engine's sudden start and unwavering idle when topping up the battery. Most of the time it whispers along, and feels satisfyingly futuristic - the motor sound you hear is artificial, but the engine note is very real. It’s also immensely easy to use – and during the few days I had with one, demonstrated the incredible versatility of the hybrid powertrain. A driver would be less confused, particularly as blindfolding them would make it a very short test indeed. 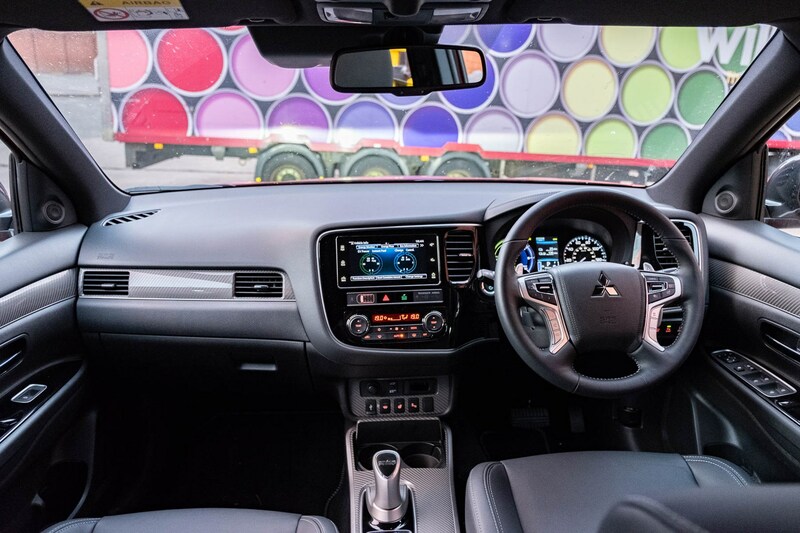 Behind the wheel the Outlander’s steering feels slower, the suspension less obedient in fast bends, and the near 2-tonne mass of the car is not well disguised. 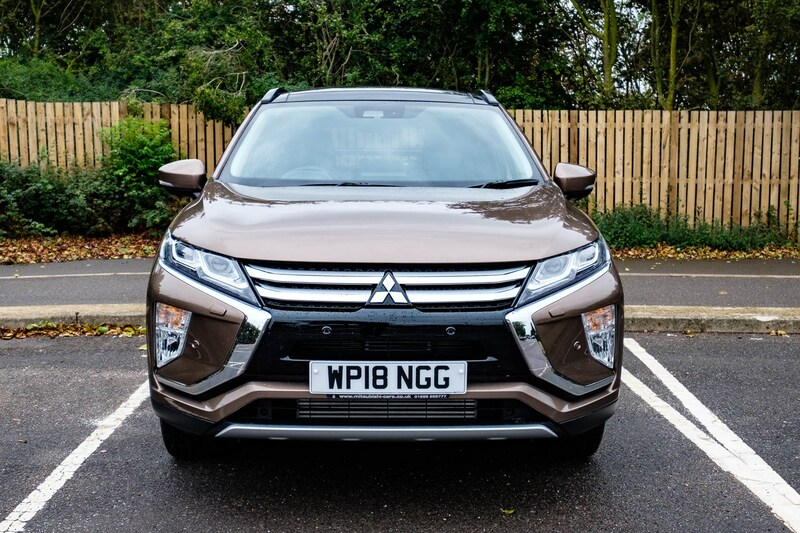 Without resorting to tape measures, the first point of contact probably has a big influence; as on the Fiat Fullback and Mitsubishi L200, the design of the steering wheel suggests that the Eclipse Cross has a 14-inch item, and the Outlander a more off-road friendly 15-inch. It even looks like the L200’s wheel, with the dynamic shield motif. 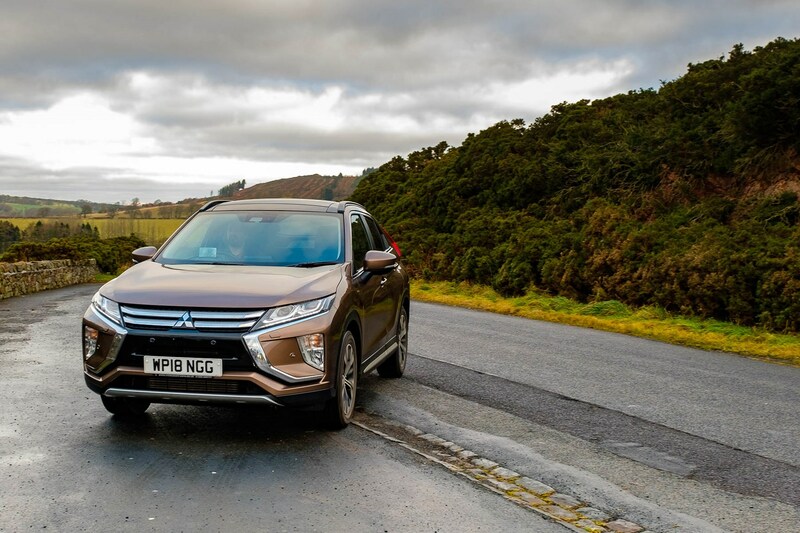 Pulling the Outlander along are two electric motors, fed by a 2.4-litre ‘Atkinson cycle’ petrol engine (longer valve openings reduce compression and thus, effective capacity to 1.7-litres with improved efficiency) and a 12kWh battery pack. 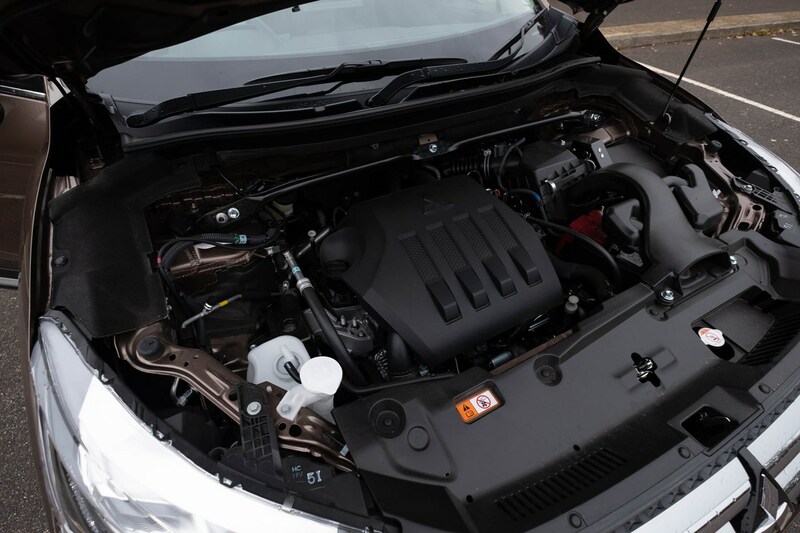 Most of the time the engine feeds the battery, and the battery feeds the electric motors (front and rear, to provide all-wheel drive and incredible low-down torque). Despite the impressive size of the internal combustion engine, it’s unstressed; output is just 135hp and 211Nm, with the front and rear motors adding 60hp/137Nm and 70hp/195Nm respectively. Under normal driving conditions with everything set to auto, the Outlander whirrs away from standstill and potters around urban traffic with only an occasional interruption from the well-insulated petrol engine; build up to fast motorway speeds and the engine provides motive power as well as acting as a generator. Like most - if not all - hybrids (some range extenders have no mechanical connection between wheels and generator), there’s a CVT gearbox which means relatively high RPM until cruising speed is attained, and rather than a revcounter there’s an informative dashboard display indicating where the power is coming from – and going. 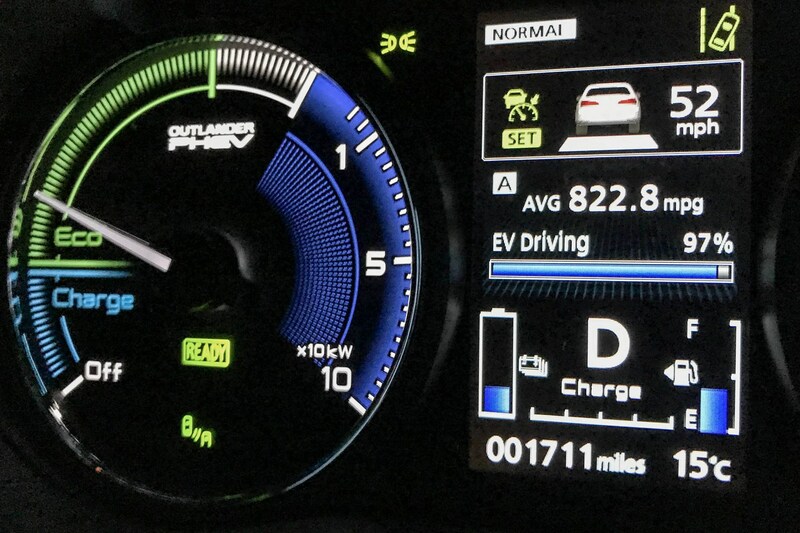 For 2019 the Outlander PHEV has gained a ‘sport’ setting in addition to the Save, Charge and pure EV mode. Sport uses the engine and motors' full potential for quick progress, but that's not really what the Outlander is for - the charge programme is rather more interesting, gaining real emissions benefits in local environments by using electric power produced by 'wasted' engine running outside of city centres - where 40 minutes of idle time (or an hour of typical extra-urban ebb and flow) can provide 80% charge. Plugging in is the ideal, of course, with a charge on domestic electricity taking 5 hours and costing £1.55 or so in Birmingham; your region may be cheaper, and lower night rates can be a real boon. For that £1.55 you get the equivalent of a gallon of petrol without local emissions – or a range of 28 miles by WLTP standards. Okay – 28 miles of EV range doesn’t sound much, but it fits with the typical usage of many cars in the UK. Covering around 30 miles a day. 10 miles across a city in a conventional car, from cold, is a really brutal situation for both the machine and environment, so the biggest win can be found here. Once you get into higher-speed traffic then the range drops, naturally, but right now the motorways around the Midlands are, to be frank, utterly broken. 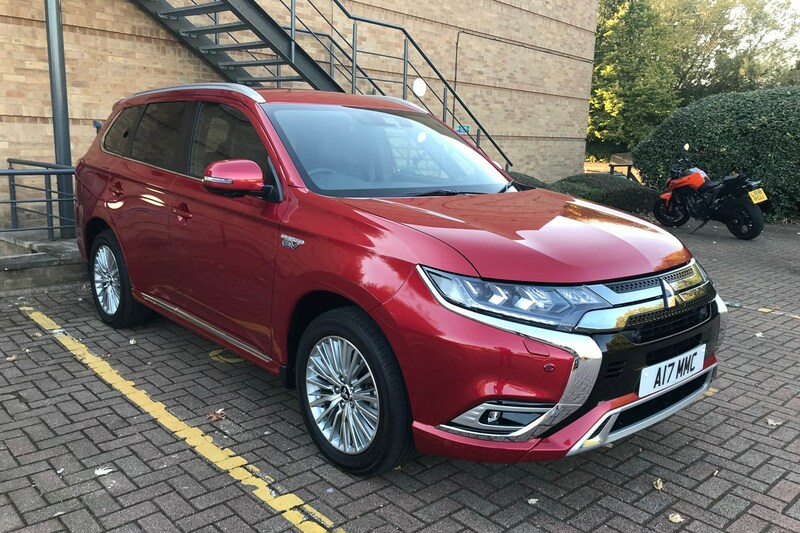 In fact, the Outlander PHEV's engine stays silent until we reach J1 for Rugby, an impressive 29 miles of pure electric driving, helped by an enforced average speed below 50mph. Reach the end of the M6, and there's a remarkable claimed 822mpg. That's after almost an hour of driving; of course the following stretch without EV assistance is covered with the economy you'd expect of a largish 4x4 driven at motorway speeds. Around Birmingham, and without time to plug in, it’s clear that the charge mode has a role to play too. Heading from Solihull to the Black Country towns, the faster 40-50mph areas are tackled with the engine topping up the battery, and the pleasingly effective stepped regenerative braking enabled at the highest rate (enough to spot a changing light and slow without needing brakes before it changes, if you plan ahead sensibly). Once in the 30mph areas, EV mode provides silent, swift and clean progress. Economy when charging is fair for a car of this size, too – bearing in mind the weight, bulk and 4x4 capability of the Outlander - at around 35mpg in town is very respectable. Likewise when cruising at motorway speeds, in normal mode you can expect around 43mpg – more if you’ve plugged in first. That’s better than the Eclipse Cross, which will return 41mpg in the tiresome roadworks, and more like 32-34mpg elsewhere. If you don’t have facilities to plug in regularly the Outlander PHEV can still very effectively take advantage of the battery and electrical assistance – filling the battery to the recommended 80%, with the onboard generator, should use about a litre of fuel theoretically. If you plug in regularly the Outlander will very occasionally start the engine just to use fuel to charge, as part of a programme to avoid petrol going stale in the tank. Some of you are probably thinking ‘if the engine can generate enough to get 30 miles out of a litre, why does it average under 50mpg? It should be over 100!’. The key element of that is ‘over 40 minutes of idling’. If you want to take 40 minutes to load your car with a gallon of fuel, your journey time is going to be somewhat extended. 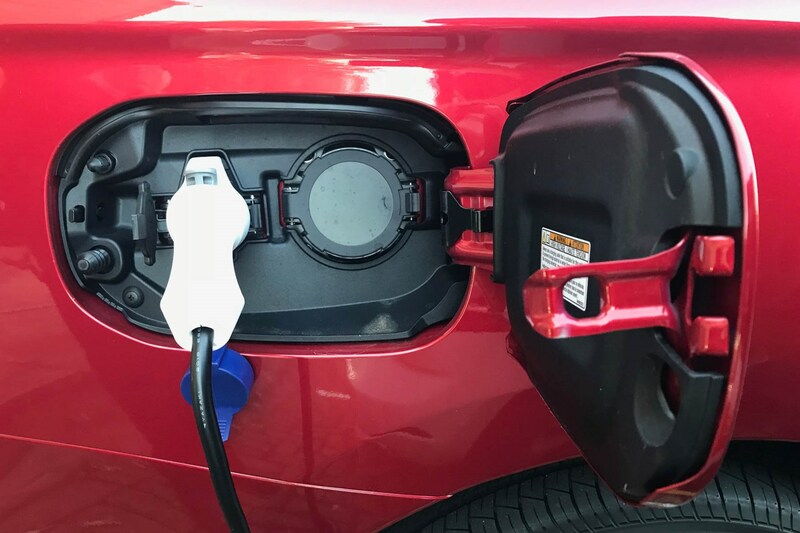 As the typical wasted power of a conventional petrol car journey can effectively reclaim that electrical charge, with little impact on cost or economy, that’s the real benefit of charge mode. 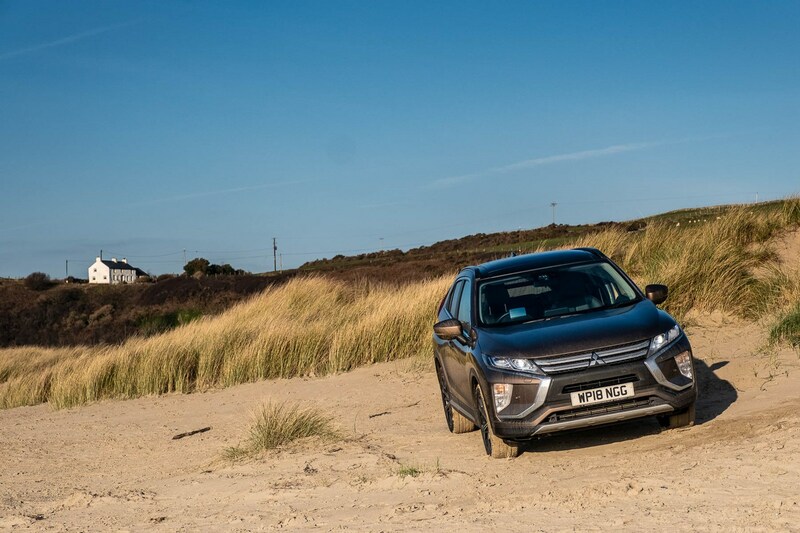 Eclipse Cross or Outlander PHEV? Eclipse Cross PHEV!. 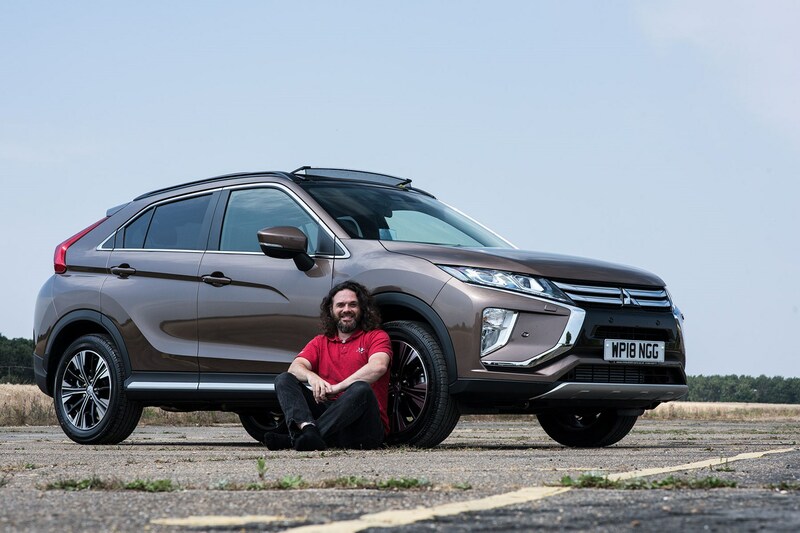 Okay, you can't actually buy one of those yet, but it’s almost certainly on the way - though as the Outlander loses the rear seats and some bootspace, you could be forgiven for wondering how much the Eclipse Cross would lose. 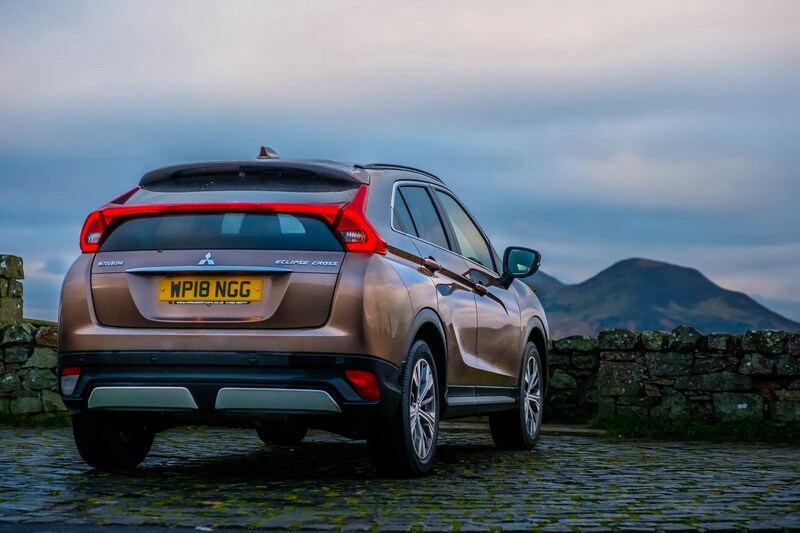 Mitsubishi's UK team say that as the Eclipse Cross has been designed around PHEV from the start, there'll be no change in interior or luggage space. It's likely the weight gains from the hybrid powertrain will alter the attitude of the Eclipse, though - unavoidably. 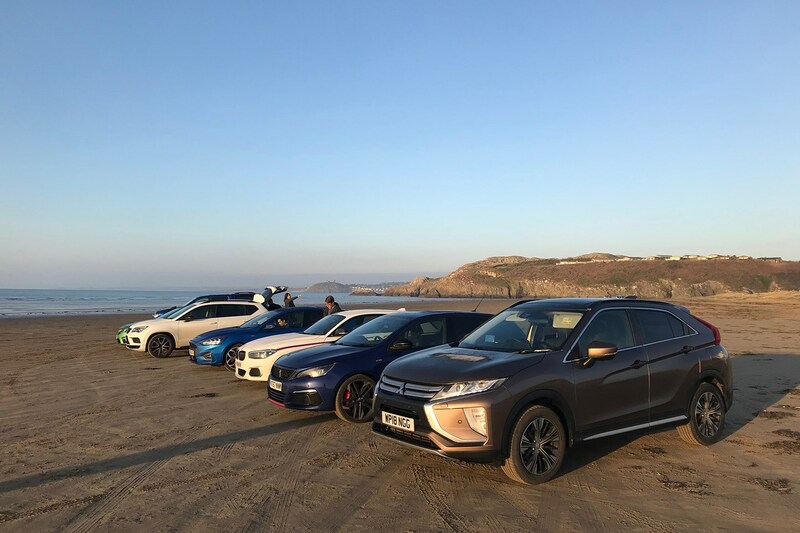 Until then, it’s a very tough call; both cars should appeal to different types of buyer, but realistically Mitsubishi buyers in the UK are already a relatively small niche – the technically advanced cars sell more on off-road capability and utility rather than inferred status and image. 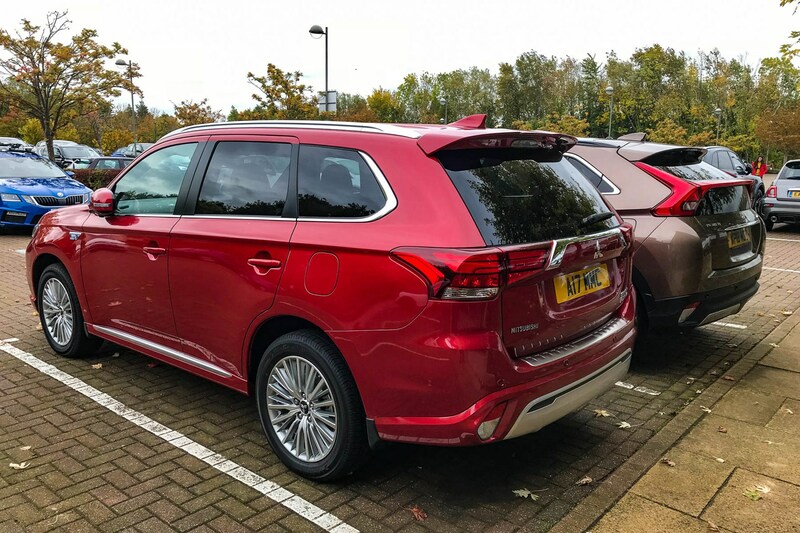 The Outlander is inherently more practical, and the PHEV’s technology is brilliant – yet it’s wrapped in a dated car with conservative interior and rather unengaging handling. To be fair, if the chassis matched the feeling of the hybrid drivetrain the Outlander PHEV would be a hovercraft - but as it’s not floating on air, a little less float on the springs would be nice. 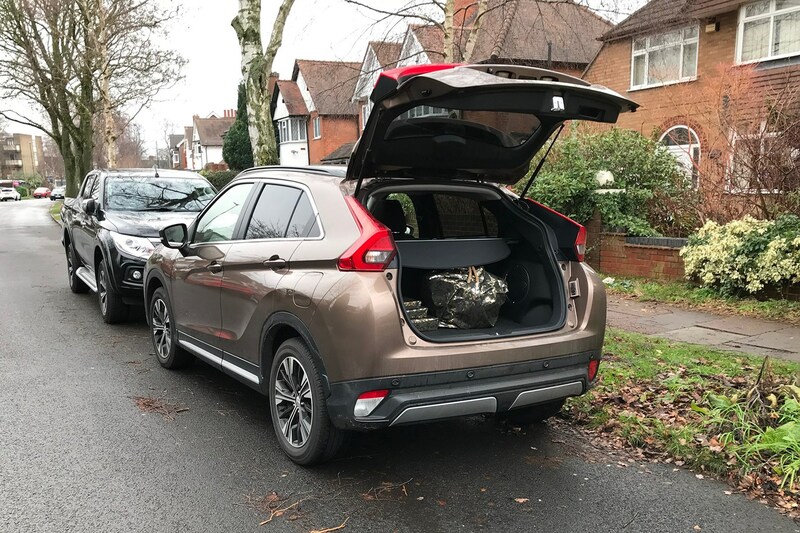 Meanwhile the Eclipse Cross is less clever mechanically, relying on a simple high-output, small capacity engine to deliver decent fuel economy for a vehicle of similar off-road capacity and passenger (if not luggage) space. The exterior is both modern and adventurous, particularly the split rear window and bold tail lights, and the interior keeps the theme going. Even the technology feels nicer to use; once you’ve adapted to the little touchpad for navigating CarPlay, you really notice its absence in other cars. Behind the wheel you can really feel the difference - the Eclipse is nimble, entertaining by comparison. In short, it justifies being considered the spory counterpart. Day-to-day running costs aren’t that different for my 160-mile a day commute, but if I lived closer to work, or across a city from the office, the PHEV would have a massive advantage. 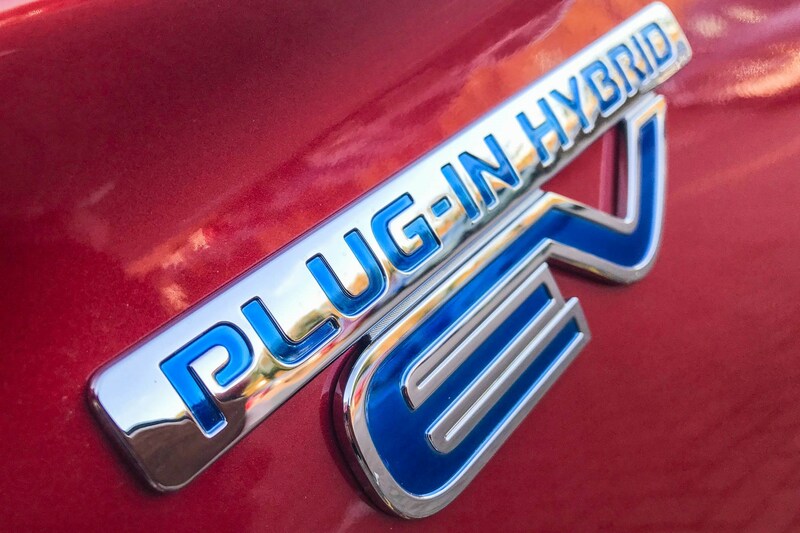 Additional benefits for the Outlander PHEV include exemption from congestion charging in London, and lower BIK (though nothing like as advantageous as it was a few years ago, the current 13% is a big gap from the 36% band the 175g/km Eclipse Cross 4 4WD falls into now). 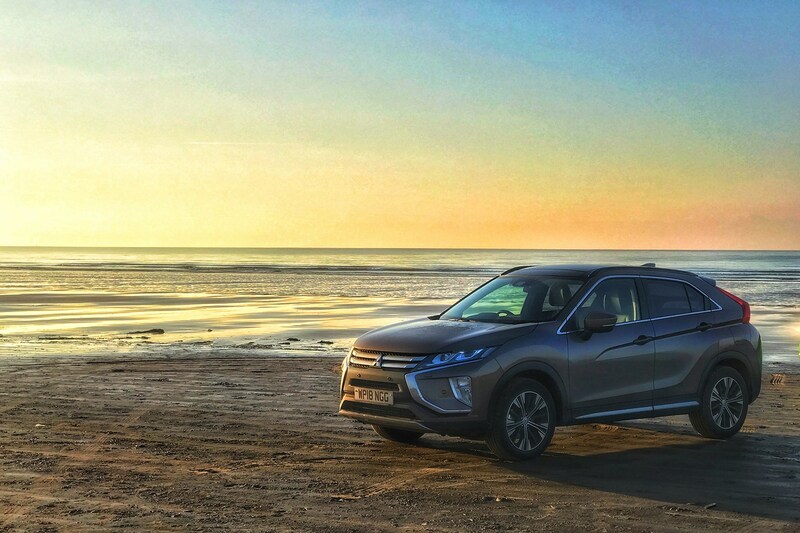 When relying on petrol, the range of the Outlander is rather shorter than the Eclipse Cross, as the fuel tank holds just 45 litres. Between fills & charges is very hard to predict; I found the Outlander PHEV would give about 300 miles for a charge and a fill, vs. 380-430 miles for a full 4WD automatic Eclipse; a 2WD manual Eclipse Cross has an even greater range. Living in a city, though, the visually smaller appearance of the Eclipse appeals, feels less inappropriate. 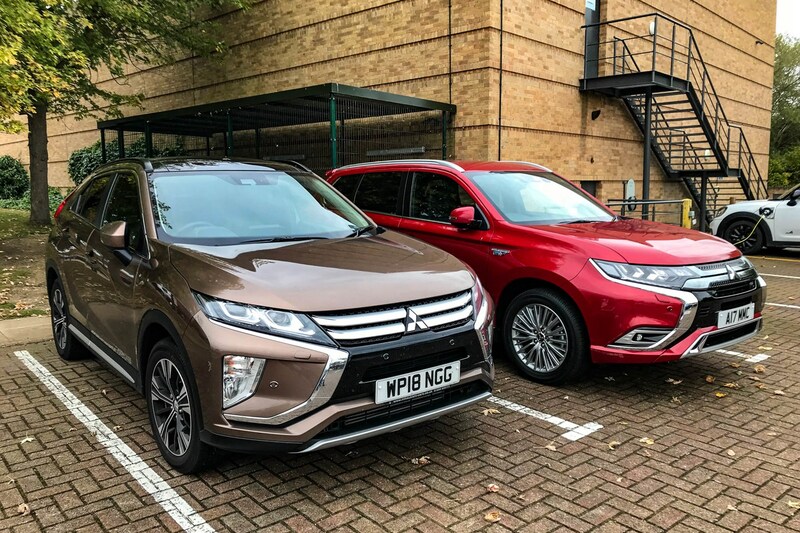 Personally, if I were told to choose between the two cars I’d take the Eclipse Cross (the Outlander PHEV is almost £13,000 more for the same spec – this is about the appeal of the car regardless of cost), but the minute an Eclipse Cross PHEV came out I’d seek to trade in and upgrade as soon as possible. 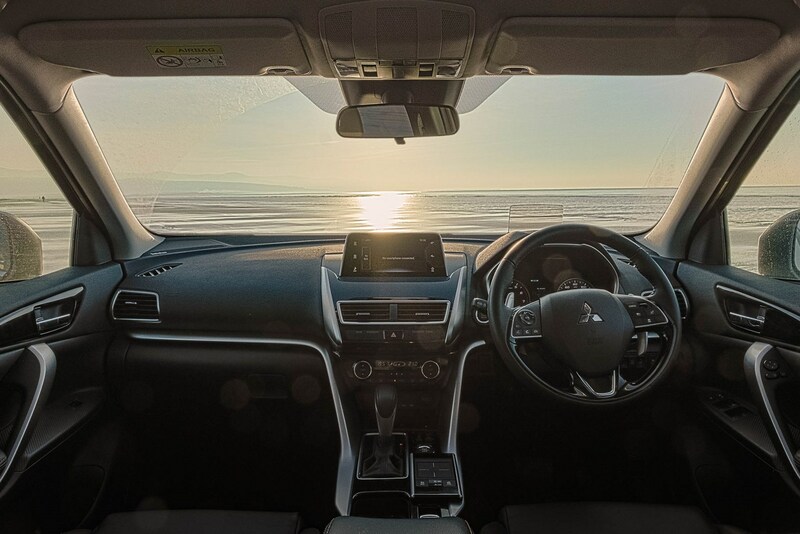 One gripe remains, though - and it's a silly one, but a common thread from L200, to Shogun Sport, Outlander and Eclipse Cross; all of which use the Mitsubishi SDA smartphone display audio. Old Mitsubishi 4x4s (including a Delica L400 Space Gear I owned a few years ago) had an inclinometer, compass and altimeter on the dashboard. 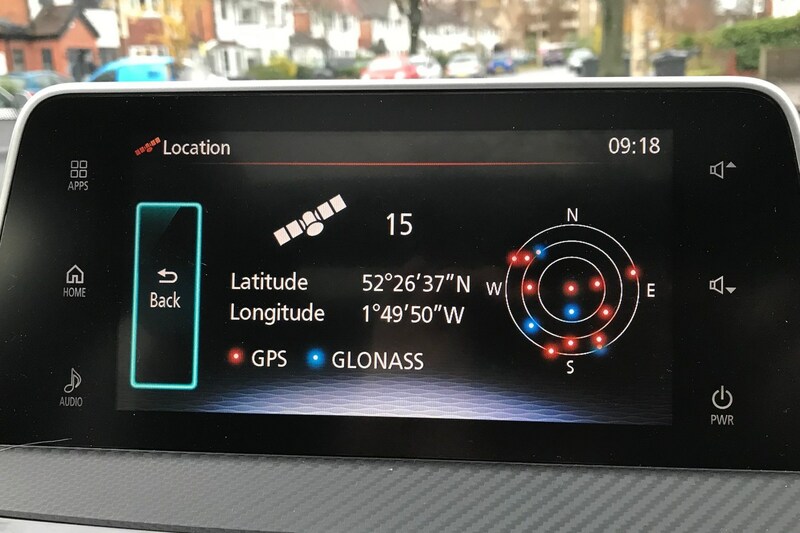 The new infotainment display can needlessly display GPS satellites - despite having no sat-nav. Why that, but not the useful off-road environmental data once offered by all Mitsubish 4x4s? 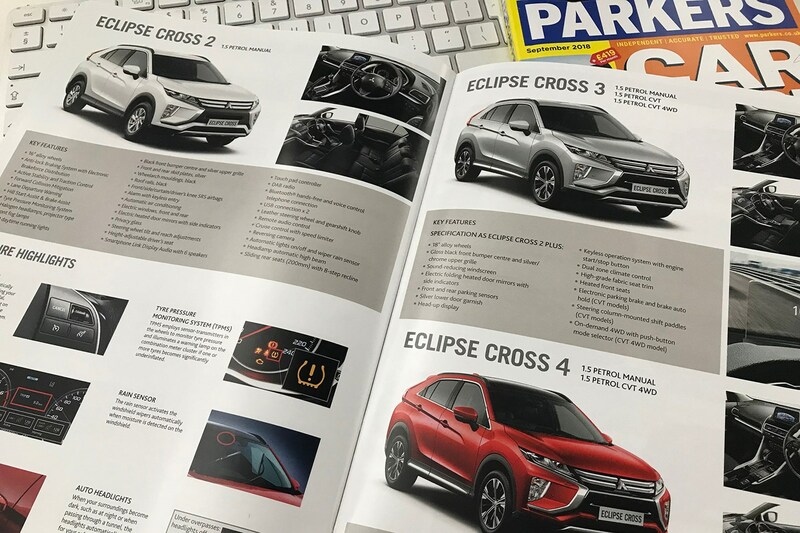 Update 6: PCP Finance - is the Eclipse Cross good value? 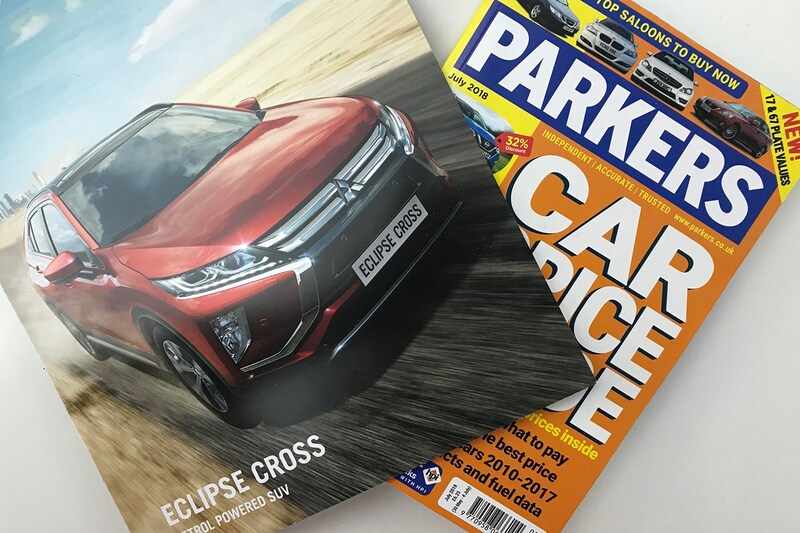 On paper the list price of the Mitsubishi Eclipse Cross makes it excellent value - but how does it stack up in PCP finance terms? The British appetite for crossovers is, frankly, astounding - and as much as I like the Eclipse Cross, it sits in a seriously competitive market. As the highest-specification model, the Eclipse Cross 4 does not look like a cheap car from the outset - so how does it stack up against competitors? For fairness, this comparison is based on features as much as list price. All of these cars include the following equipment, whether standard or added as an optional extra. 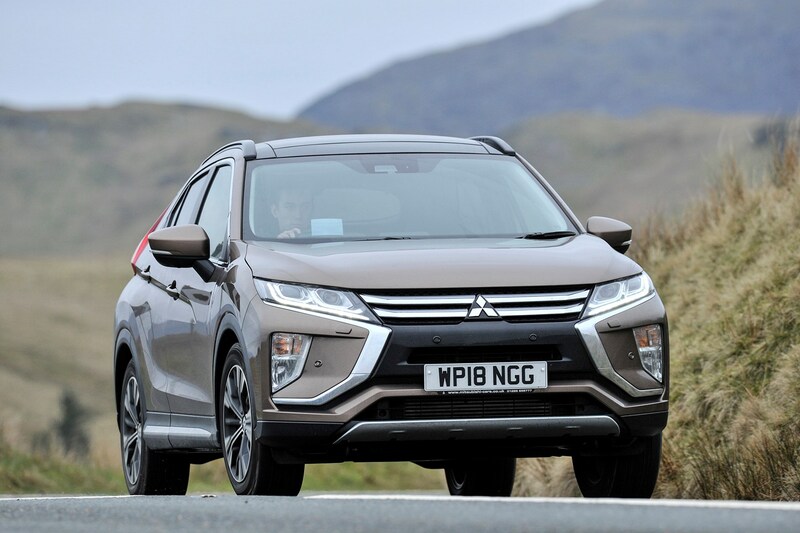 Prices have changed a little since this Eclipse Cross was specified - however, the difference is small, and the monthly payments have reduced slightly, as Mitsubishi has doubled its deposit contribution discount. All PCP quotes compared below are based on a 36-month contract, with a 10,000 mile-per-year allowance and a £1,300 deposit. 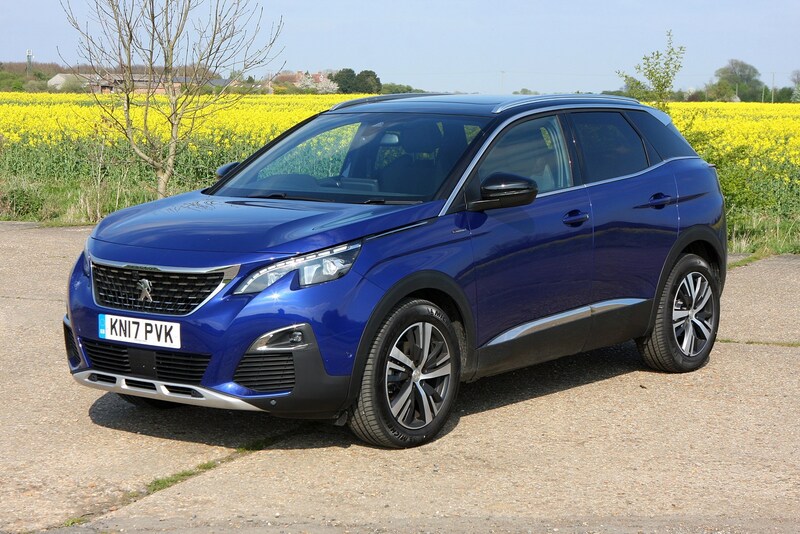 Do note that Peugeot doesn't offer PCP over three years on the 3008, so we've had to opt for a four-year contract, which gives the Peugeot an artificial advantage, as longer contracts typically lower monthly payments. What sets the Eclipse Cross 4 apart from its rivals? Top of the list is, of course, the styling. I'll risk journalistic objectivity and go on the record with the opinon that most crossovers are fairly offensive to look at, if not downright ugly. Yet I like many aspects of the Mitsubishi Eclipse Cross - up front, there's nothing that looks out of place. 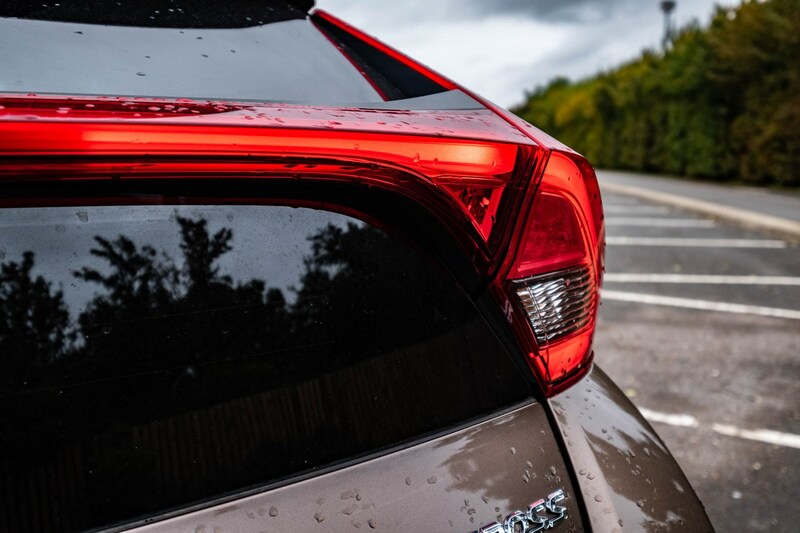 Likewise the profile, with the bold rear lights, has become something I look forward to seeing after a long day. If all I can find to pick on is the rear bumper, it's doing well - and even that has become normal. Inside is equally pleasing, and aside from some material variety, I actually like the view and appreciate many of the details, such as the arc below the windscreen, the tapered housing for the infotainment screen, and the centre console layout. Despite suffering the standard-issue 40-something bad back and accounting for the lack of adjustment compared to some cars, the Eclipse Cross seats are very pleasant for me. Controls fall easily to hand too, and visibility is good - surprisingly so given the large pillars at the rear. Naturally your expectations and shape will be different, but this is a car that fits me well. 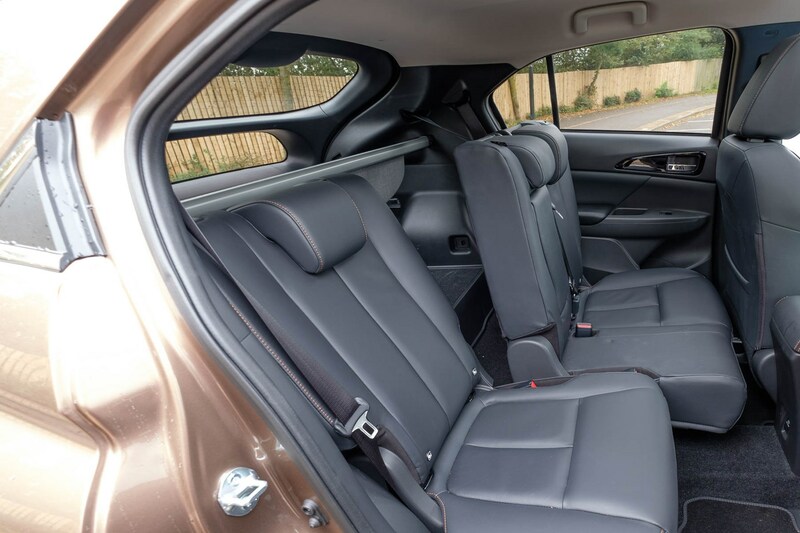 It also fits passengers - the rear door opening and legroom are particularly impressive for a coupe-crossover. The fastback tail does mean it fits in a very odd segment of the market, and typical crossovers are perhaps best summed in our family SUV group test. This is where the Eclipse Cross meets our needs, but not necessarily expectations. 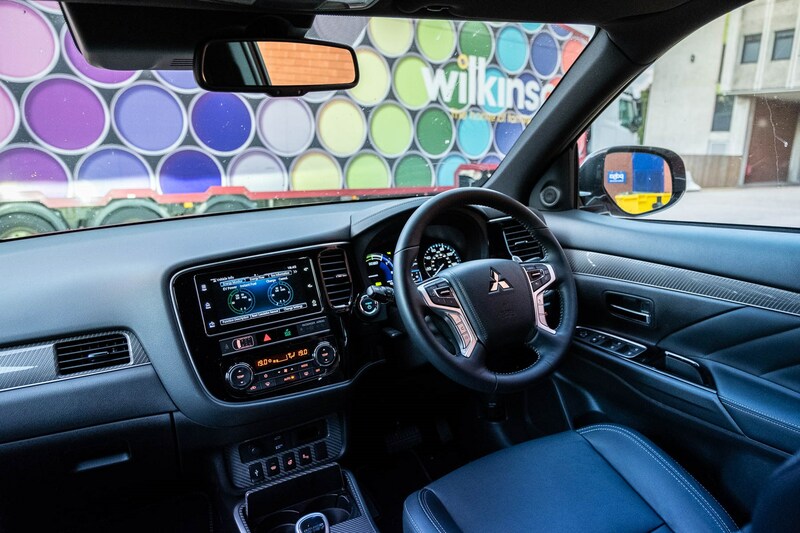 Mitsubishi's SDA media system is immeasurably improved by the touch-pad navigation which for the time being, is unique to the Eclipse Cross - but other firms have better media systems overall. The Rockford Fosgate audio is satisfyingly thumpy, in a childish way, but it won't make your inner audiophile happy. In a similar manner, the adaptive cruise control and emergency assistance are good enough, useful, and definitely a reason to spend more for the higher specification - but aren't the best systems available at this budget. The big win, of course, is in the most important technology - the all-wheel drive and 1.5-litre turbo engine. Once familiar with the gearbox's relationship to the engine's output, it's a very effective combination, and capable of covering ground securely and rapidly with very little effort. Manual transmission cars may be very different, but if buying for myself, the quality of the automatic is very important. Mitsubishi has a nice list of alternatives to the Eclipse Cross ready made – as mentioned in the first update. Unfortunately, I've only driven a few so far, and they're a diverse mix. Those options are also focused on lower-specification, front-wheel drive cars. What can rivals offer if you've got the budget for the top of the range Eclipse Cross 4? 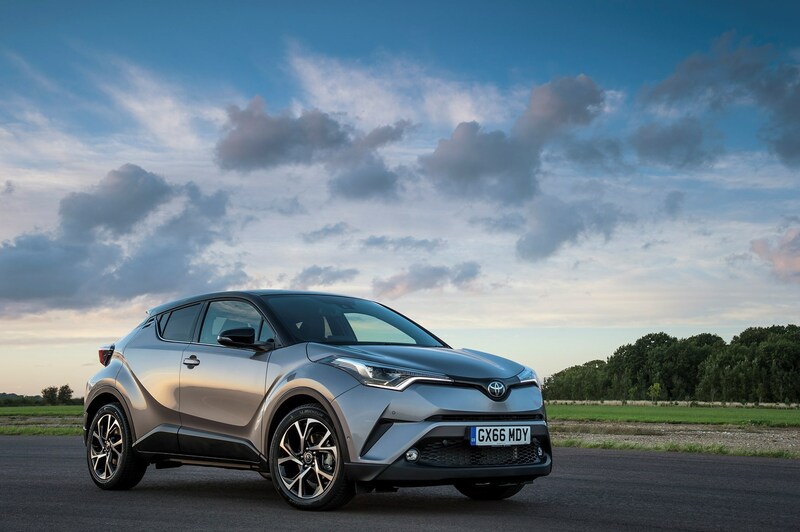 Our Car of the Year for 2018, the Toyota C-HR does futuristic well, and is well made too. However, the range is surprisingly limited and the only all-wheel drive model is the 1.2-litre 116hp petrol version, which is at a significant disadvantage against the Mitsubishi. It takes 11.4 seconds to go from 0-62mph and the top speed is just 114mph. Dynamic trim is closest to the Eclipse, but there's no panoramic roof option, and adding leather and upgraded sound costs £1,595 for the premium pack with JBL sound (not included in the monthly payment below). Most buyers looking at the more expensive end of the C-HR range may find the 1.8-litre hybrid more appealing. Interior trim is a cut above the Eclipse Cross, with holographic inserts and textured materials, but the rear space is cramped and claustrophobic by comparison. C-HR wins: Interior design highlights and material choices, hybrid option. 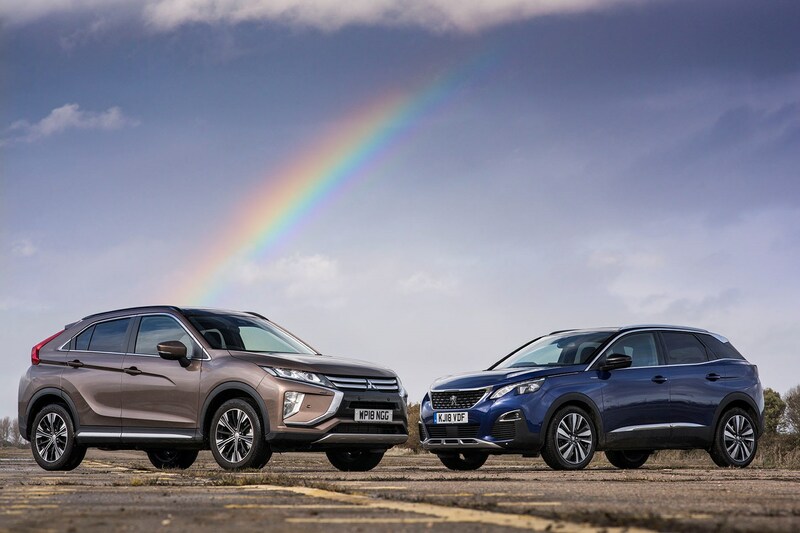 It's not quite the same, but Keith WR Jones' long-term Peugeot 5008 is a close match for the 3008 - and that's what Mitsubishi think you may be considering alongside the Eclipse Cross, so we've had a few opportunities for comparison. They're aesthetically very different vehicles; SUV ground clearance aside, the Peugeot is very family-focused and upright. Again, interior materials are the biggest leap over the Eclipse - with a tactile fabric dash and attractive piano keys. The actual cockpit is far less appealing to me, though. Some aspects of ride quality are preferable, and the steering is satisfyingly sporty, if a little artificial for my taste. The big shock, however, is the cost. 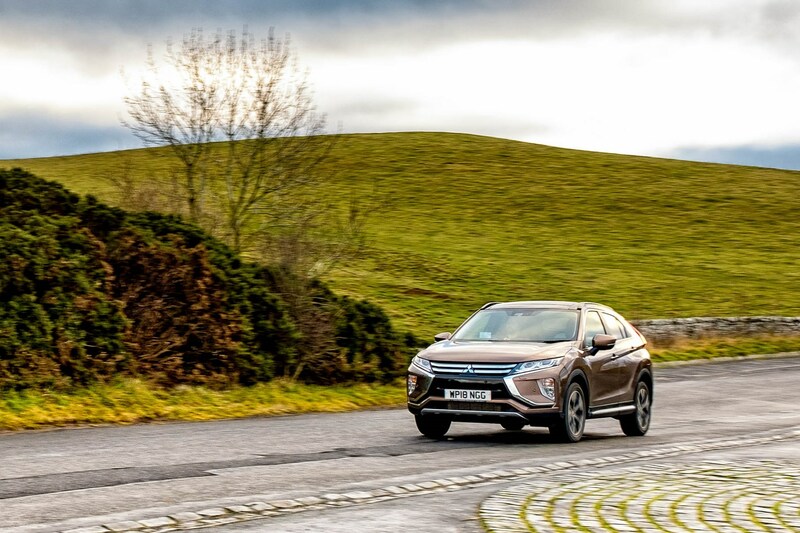 To get close to the Eclipse Cross 4, it's necessary to begin with a 3008 Allure (the entry-level Active precludes most optional extras), and the closest petrol engine is the 131hp three-cylinder 1.2-litre. 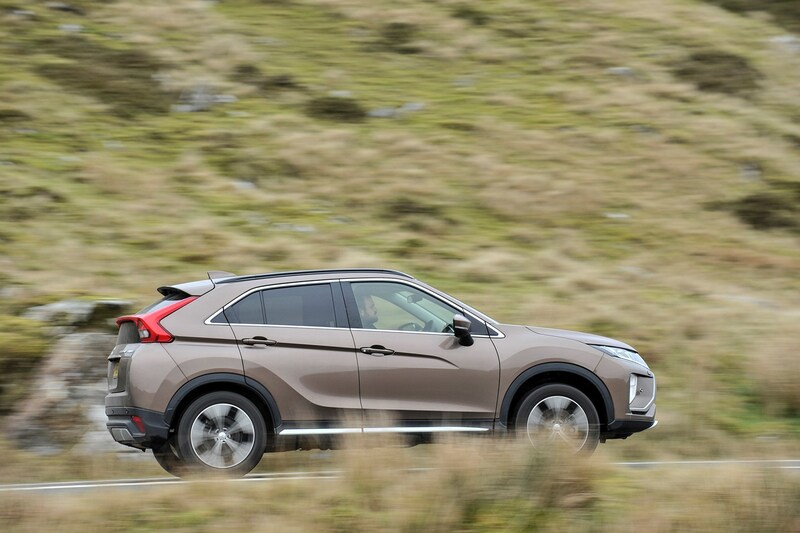 Performance is, on paper, quite close – 0-62mph is around 10 seconds, and top speed is 117mph (the Eclipse Cross top speed is around 127mph, but the CVT gearbox allows very relaxed high-speed cruising). Green credentials are better, with 120g/km CO2 and 54.3mpg claimed. Our long-term test 5008 with the same engine is returning 34.9mpg in real-world use though, which isn't far off the all-wheel drive Eclipse Cross figures. 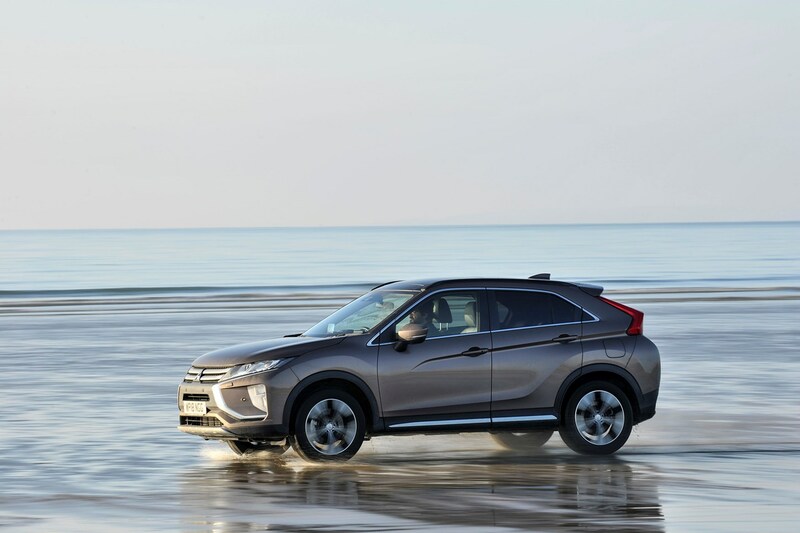 Although the base price of £27,509 is less than the Eclipse Cross 4, the number of options needed to get the same equipment adds an impressive £4,660. Metallic paint is a similar cost, at £575. 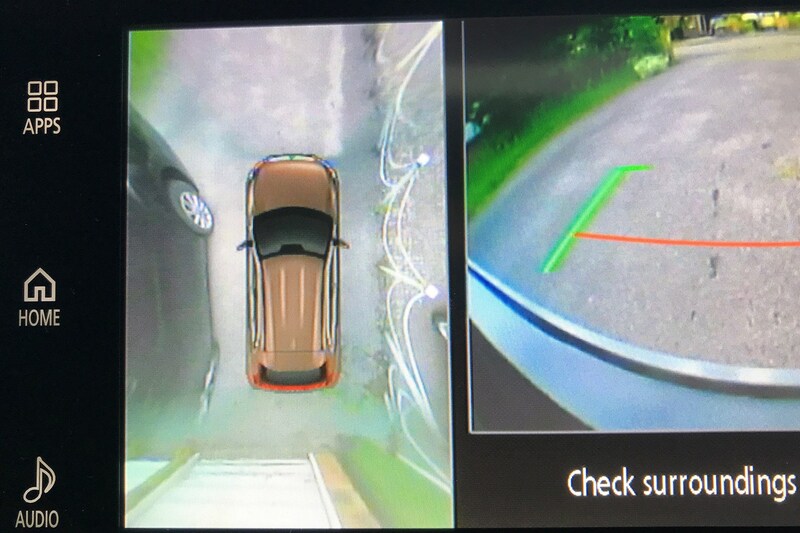 Some options do exceed the equipment available from Mitsubishi; specifically the 360-degree camera includes automated parking. More importantly, the Peugeot has far higher monthly payments, despite costs being spread over four years rather than three, which normally serves to reduce the instalments. If your budget is a little higher, the £35,929 (with options) 3008 GT Line Premium 1.6 180hp petrol costs £575 per month on the same basis, with better overall specification as standard and performance, It's still front-wheel drive, though. 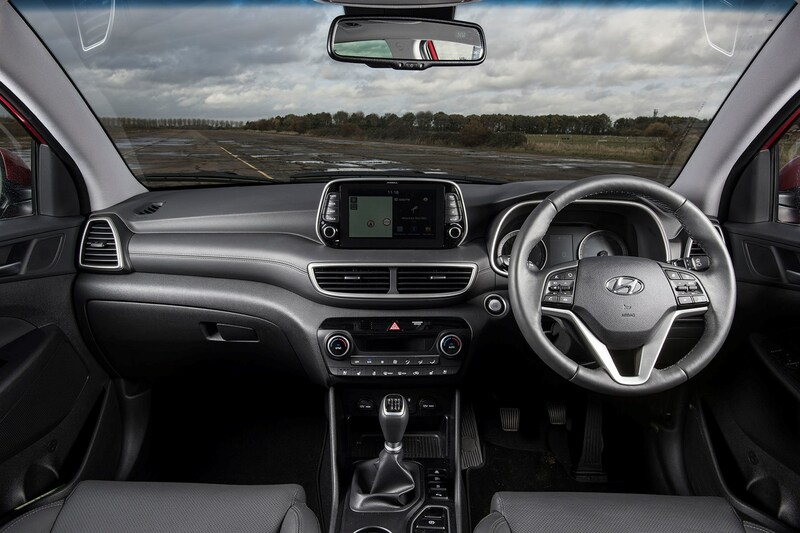 3008 wins: Choice of materials on dashboard, boot space, steering feel, big opening panoramic roof, ground clearance. 3008 loses: Heating and infotainment controls, forward visibility, only hybrid models will offer all-wheel drive. 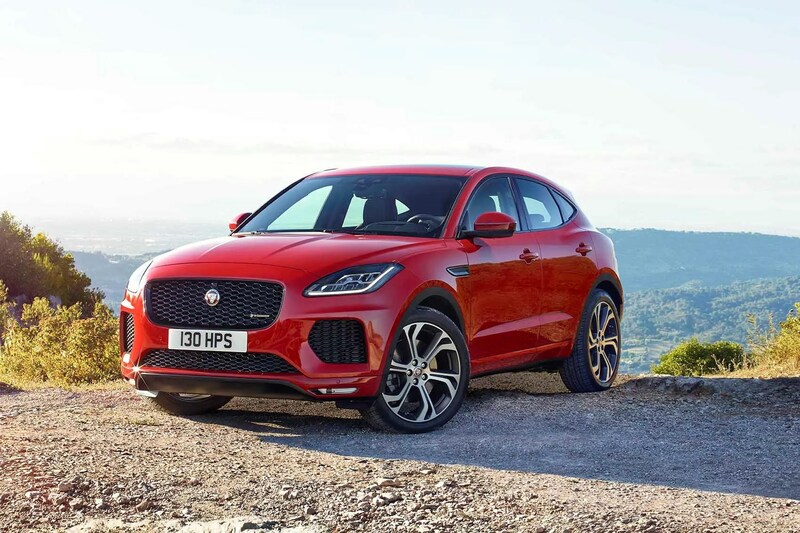 The Jaguar E-Pace is not something that would leap out as a rival to the Eclipse Cross, but they're closer than you may think. The E-Pace range starts at £28,930 for a 150hp front-wheel drive diesel manual, and offers four-wheel drive from £32,505 with the 150hp diesel and automatic gearbox. Choose petrol, and your entry level is the P200 AWD, at £33,260. This is a quick and capable premium compact SUV. Specification is lower than the Eclipse Cross, with fabric seats, no sunroof and basic audio; on finance, however, you can take the highest-spec HSE for only £587/month. Adding the sunroof costs £970 regardless of model. Specifying an E-Pace to match the Eclipse Cross in all areas gets expensive, but if you're tempted by a luxury badge you may be prepared to make sacrifices. 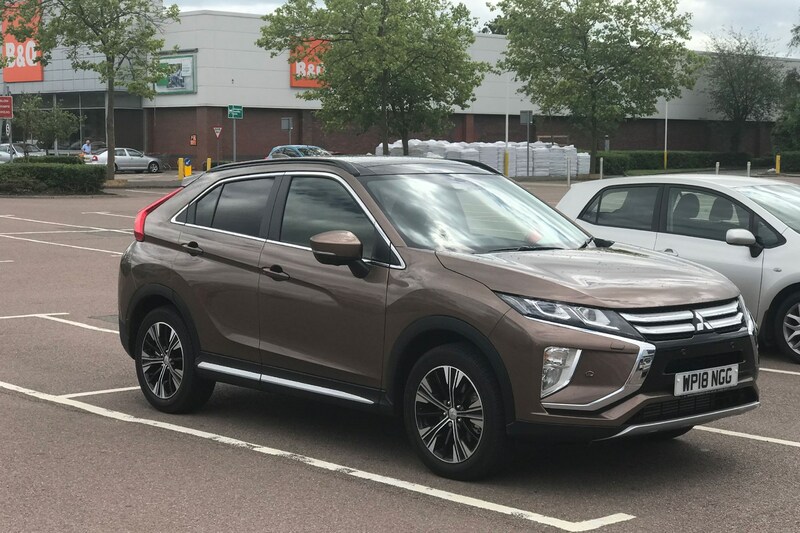 Is the Eclipse Cross 4 good value for money? Fundamentally, yes. Higher specification cars don't always reflect the best value, and a direct comparison between models is always tricky. If you want a 4x4 family car, the Eclipse Cross is a very compelling and capable package for a surprisingly low cost. 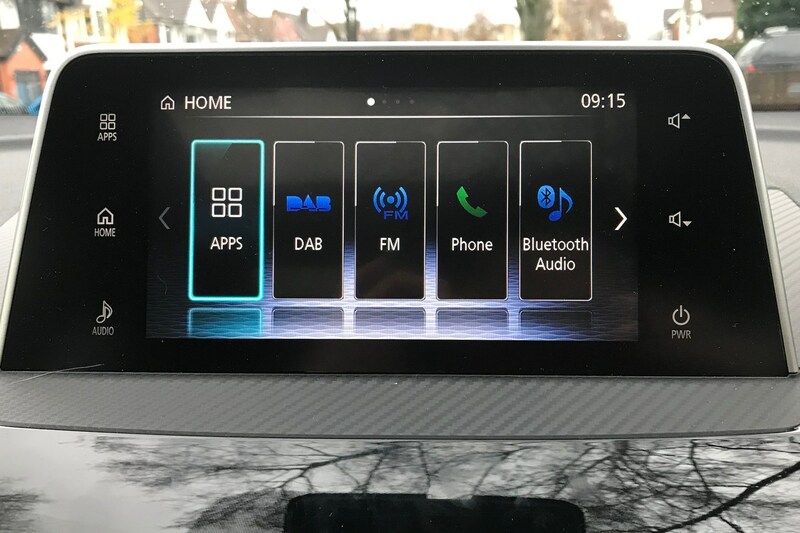 On the face of it, Mitsubishi's Smartphone Display Audio (SDA) is either a clever recognition of how media use and technology are charging, or a really basic alternative to a radio that minimises the need to fit different levels of kit to different specifications. Unlike the traditional DIN-sized (or double-DIN for those with screens) box, there's a flat screen on the dashboard, and that's the lot. There are no mechanisms and the software is very basic. However, everything infotainment-wise I've done with the car since getting it has been powered by my iPhone, from making hands-free calls, to navigating using Waze, or listening to stored or streamed music. For most users with a smartphone, it's probably the most efficient, brilliant system; for users without, this is a good reason to buy an old one to get some navigation and streaming. An iPhone 5S will support CarPlay, so you don't need to spend a lot. The touchpad is also genius - going back to cars with pure touchscreens, I miss it so much. Once familiarised it really is quick to use, and unlike some multimedia interfaces, it avoids being too fussy. SDA does support some basic media playback features, and Bluetooth calls, all of which can be accessed by voice control. That button is usually employed for Siri. Fortunately the Eclipse Cross 4 has the upgraded Rockford Fosgate audio, which lifts the otherwise sparse SDA system to a more entertaining level. Without it the Mitsubishi would have four channels of 35W audio. For UK buyers, the brand Rockford Fosgate may seem unfamiliar. An American brand founded in the 1970s, Jim Fosgate created some of the first bespoke car audio products like aftermarket amplifiers - and also had a hand in the technology behind Dolby surround sound and quadrophonic sound decording. Unlike the name-checking, celebrity endorsement of things like Beats Audio where a brand is applied to a more generic corporate product, Fosgate's name comes directly from the pioneer responsible for the circuits and later, algorithms they built a reputation on. In the audio menu is the appealingly titled 'punch' setting, which seems obvious enough – it's a loudness control, right? The effect may seem that way, but it's actually a trademarked term for Jim Fosgate's pioneering EQ and filter for car audio, which boosts low frequencies and selected treble frequencies. 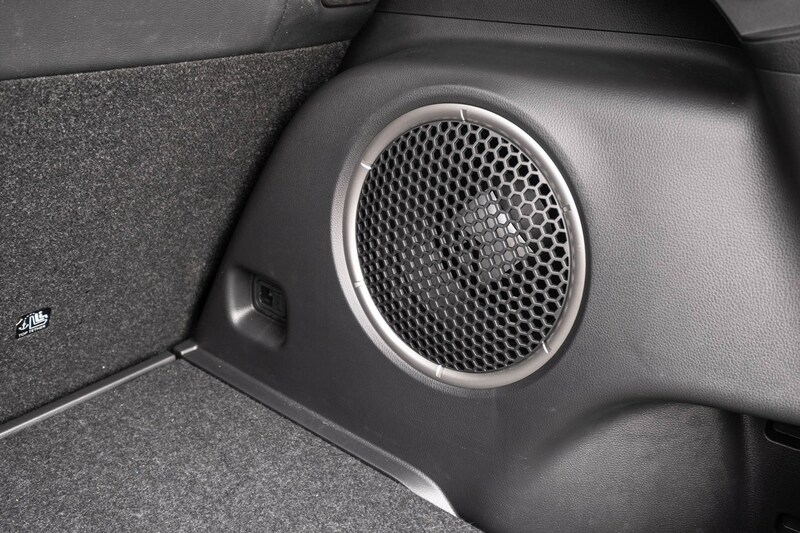 Paired with a digital signal processor (DSP) that tunes the output for each speaker to the car they're installed in, the effect is an audio system that, er, punches above its cost. 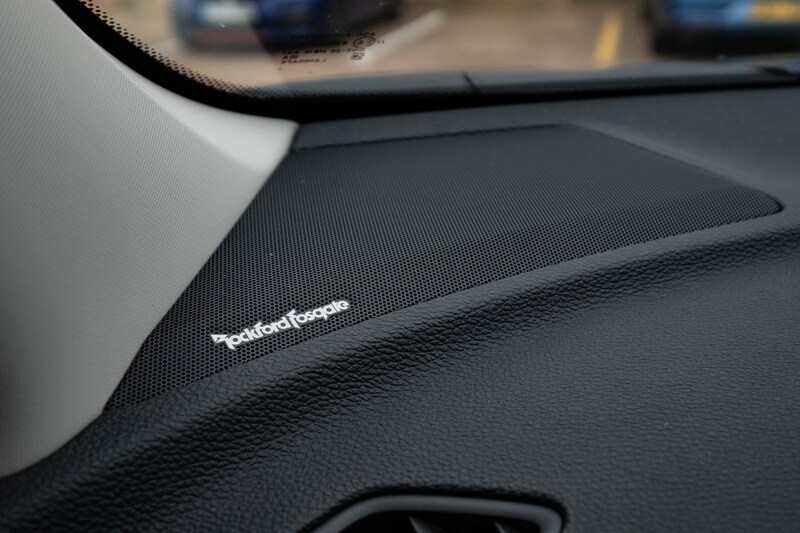 Far from being some unknown then, the Fosgate logo ties the Eclipse Cross 4's 710W audio system directly to the advanced features offered by the DSP processor and speakers. What's the Eclipse Cross audio like? It supports DAB and FM radio - though the audio processing is disabled for those sources beyond basic EQ. There's no CD player, nor is there an aux input, but it does have two USB ports, Bluetooth and both Android Auto and Apple CarPlay. Radio reception is good, and audio playback is clear; talk radio like BBC Radio 4 is very comfortable to listen to at lower volumes without struggling to understand what the politicians are arguing about*. Switch to Absolute '80s and Prince sounds as good as rose-tinted memories ever can, Radio 3's dynamic range isn't lost and Hancock's Half Hour on R4 Extra sounds disturbingly un-muffled (and misogynistic, and so forth). Switch to a media source and the EQ, surround sound and punch features are active. Full volume is loud enough - and thumpy enough - to feel like a boy racer. Put some '90s electronica on, and there's a pleasing lack of buzzing and rattling from the interior even with Orbital at full blast. 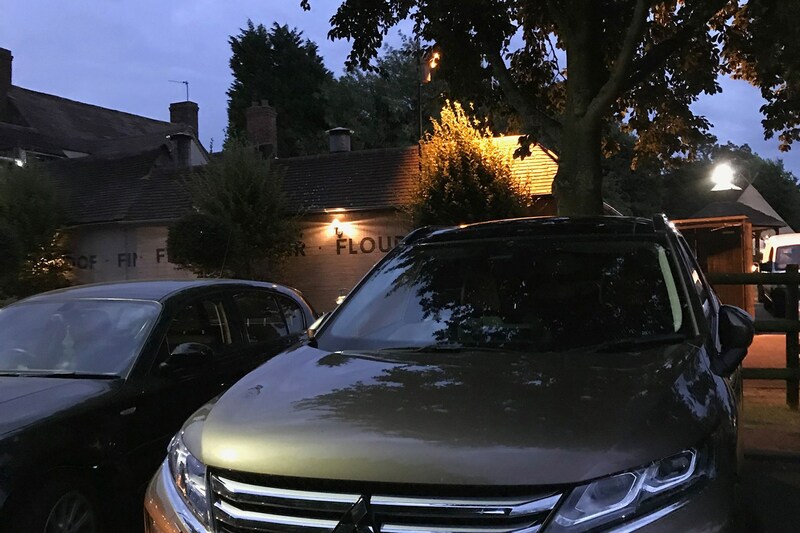 Mitsubishi might not offer something at the level of Land Rover's Meridian setup, but for a sub-£30,000 car it's great, a much-loved small town nightclub rather than a stuffy concert hall. How many speakers does the Eclipse Cross 4 have? There are two 1.0-inch dashboard tweeters, two 6.5-inch front door woofers, two 6.5-inch rear door speakers including coaxial tweeters and a rear mounted 10.0-inch dual voicecoil subwoofer, for a total of nine speakers driven through eight speaker channels via a 710W DSP amplifier. 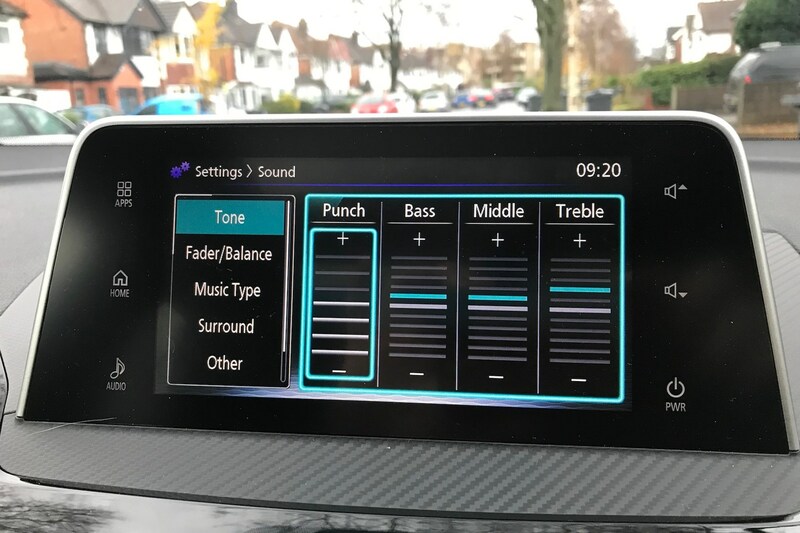 Although the SDA head unit is relatively new, the nine-speaker setup with subwoofer has featured on past Mitsubishis - such as the Lancer Sportback GS4 and the Evo X. 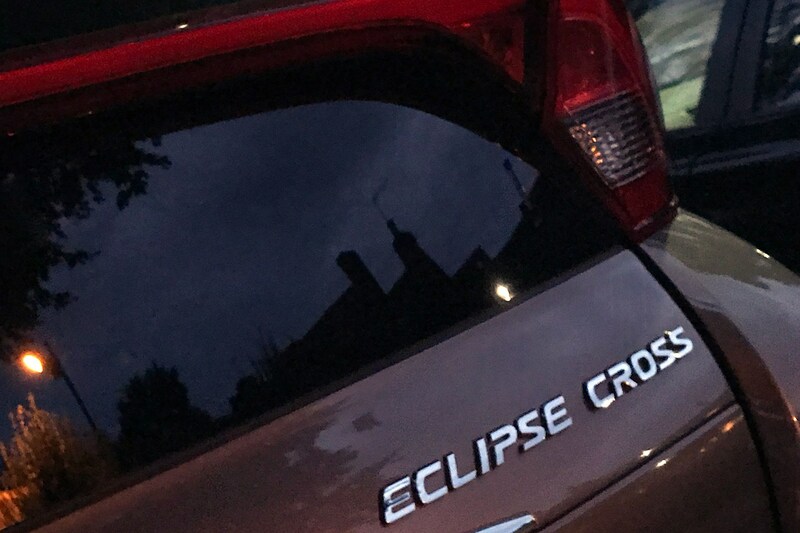 Does the Eclipse Cross have surround sound? Yes, though it's DSP driven virtual surround - there's no centre speaker. Both dts surround sound and PremiDIA-WIDE are offered, the former being best suited for recordings made to take advantage of the industry-standard processing. Many songs and soundtracks are recorded for Dolby ProLogic and similar encoded surround formats - from Michael Jackon's 'Thriller', which places the footsteps of approaching zombies all around the car in the HIStory DVD 5.1 mix, through Azimiuth Co-ordinator-intact 'immersion edition' Pink Floyd recordings, to Isao Tomita's 1970s quadraphonic synthesizer classics. Choose the correct version, remastered for modern systems, and the swirling analogue synthesizers of Arabesque No. 1 or the pizzacato pops of Passepied jumping around the listener all come through astonishingly well. Though the car lacks a CD player, the processing works fine on MP3 and other digital files. 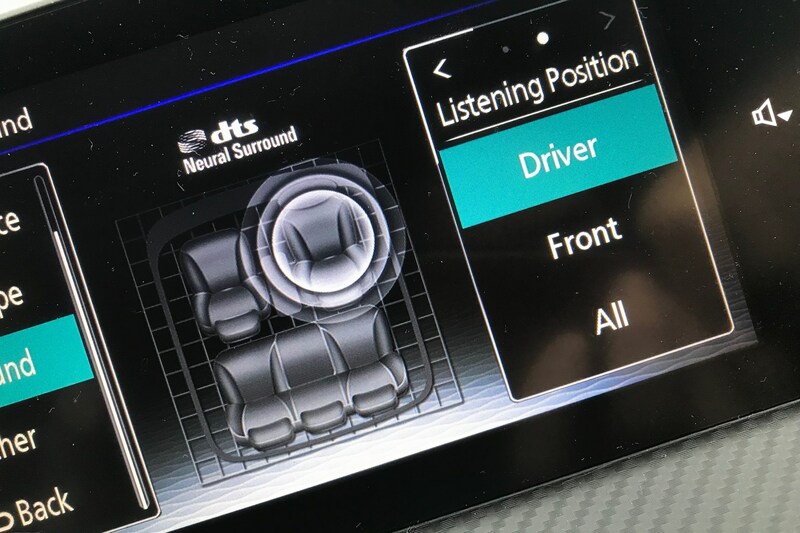 dts Neural surround sound can still decode those signals and create a virtual centre speaker for a simulated 5.1 surround mix in the car. 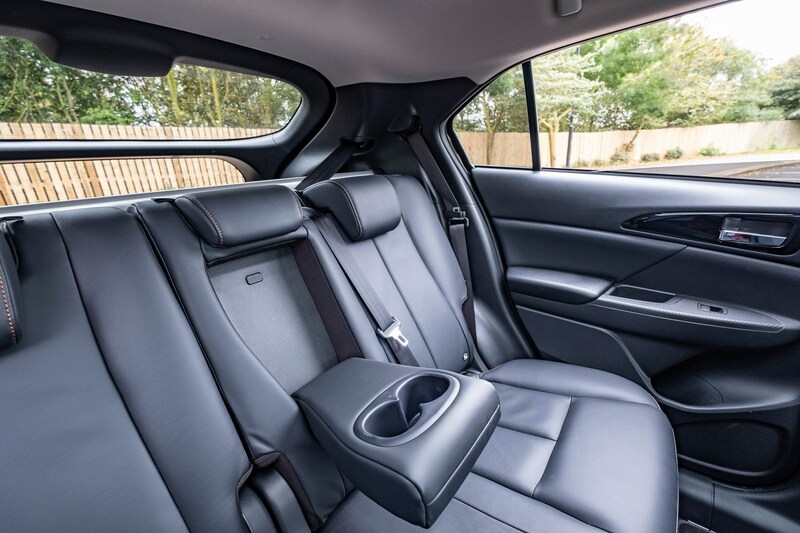 It can be configured to suit all occupants, front occupants or just the driver - which is remarkably effective. A stereo source will have a virtual surround mix applied, which can sound a little flat sometimes - PremiDIA is more suited to those sources if you want a lively, sparkling audio reproduction, and I've tended to use that more for a way of adding that cheap-thrill punch to rather flat pop recordings. Audiophiles will be pleased to know that support for USB devices includes the ability to play lossless FLAC, Vorbis and uncompressed WAV files as well as unprotected AAC, MP3 and WMA. 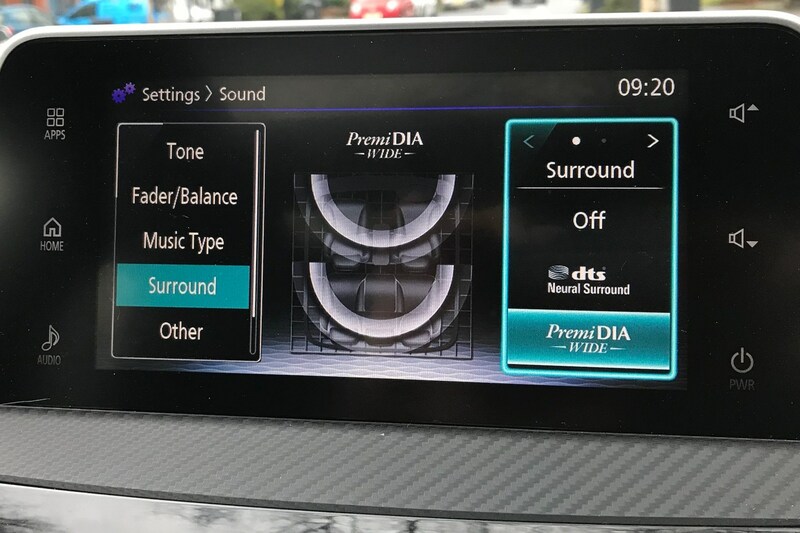 PremiDIA is Mitsubishi's way of processing sound to be driver-focused (or split between front and rear occupants) without special recordings. It can create a stereo spread with a more pleasing, if technically inaccurate, soundstage and presentation. Unlike Dolby, dts and Rockford Fosgate, this is Mitsubishi's own audio technology, which has evolved over several years. Dolby volume is also included, which dynamically adjusts the volume of different tracks and sources to avoid sudden changes in loudness. How are handsfree calls on the Mitsubishi Eclipse Cross? Having only tested this with two phones, and both on O2, it's unfair to suggest an absolute rating. On Huawei's Android-based P9, the quality was muffled, though signal remained good. With an iPhone 7 Plus, sound from the car is okay - albeit quiet unless at full volume, and annoyingly unable to move which speaker it's coming from. Users on the other side of the call suggest that audio drop outs were quite common. It falls in the middle of cars tested with the same iPhone, where Audi tends to be best. Ease of use for bluetooth calling is OK; with both Android and Apple platforms their own voice commands are simply better. Is the Rockford Fosgate upgrade worth it? Absolutely. It's part of the package on the Eclipse Cross 4, and contributes a lot to how much value the higher specification adds to the car. When testing cars, it's easy to lose sight of what you get for a particular budget - plenty of £40,000 plus high-spec SUVs and executive cars with optional high-end audio can lead to unrealistic expectations. 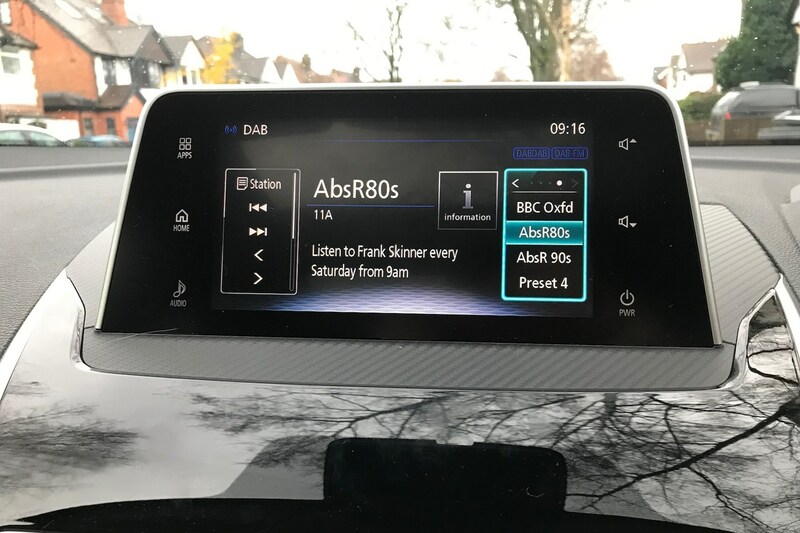 More to the point, aspirations to take an audiophile approach to car entertainment systems can be an endless rabbit warren; a story comes to mind from a Jaguar engineer in the 1980s, who specified an impressive set up for the upcoming XJ40. The board rejected the system, with the harsh reality of a budget of £100, rather than the near £400 he'd specified. 'No! £100 for the lot!'. Even in the early '80s, that was about enough for four paper cone speakers and, if memory serves, a Pye cassette player. A 21st century sub-£30,000 car is going to have some tight budgetary constraints, and there's already a lot of technology in the Eclipse Cross. Mitsubishi and Rockford Fosgate have done what many hobbyist car audio enthusiasts strive to achieve, with a dash of surround-sound wizardry - an affordable, pleasing setup that can produce enough volume to amuse, enough clarity to please the average keen listener, and tight enough integration that nothing buzzes or looks out of place. For the class and budget of car, it's pretty impressive. 'Hey Siri... play Robyn's latest album'. * It's probably Brexit, to be fair. Update 8: Apples and Oranges - Can the Mitsubishi Eclipse a couple of popular rivals? Thanks to this family crossover group test, a chance to get behind the wheel of two strong Eclipse Cross rivals couldn't be passed up. 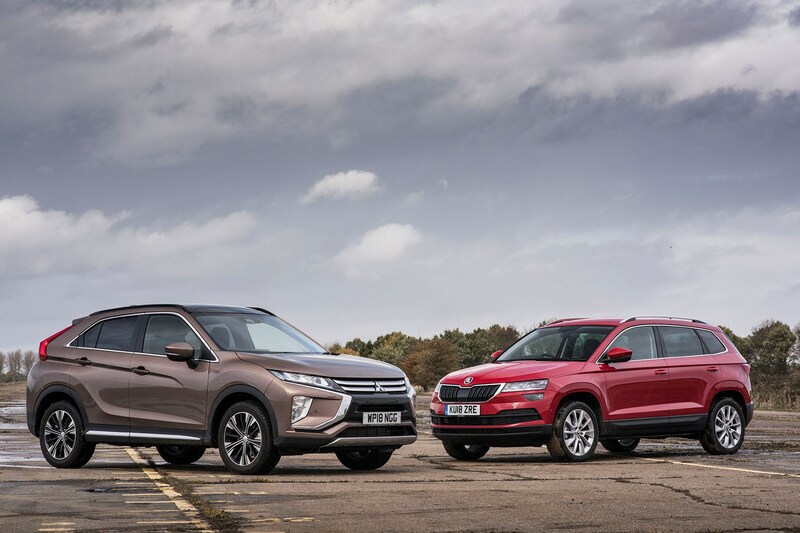 Taking some time behind the respective steering wheels of the Hyundai Kona and Skoda Karoq, after almost 10,000 miles in the Mitsubishi, provides two very different firms' approaches to this class of car. Both are popular choices, too, with the unscientific barometer of 'How many do I see during the commute' surprisingly biased towards the Hyundai. (Shout out to the two Eclipse Cross owners I've passed this month. It's a good looking car in black, too - and colleagues report seeing many more on the roads generally). Grabbing the keys to the Tucson, I'm at a slight disadvantage in that it's not a model that's crossed my path before. The engines and underlying technology are a total mystery at this stage, and the only Hyundais I've driven prior to this have been the rapid i30 N, a short trip in a Kona, and an old 1990s Pony. Apparently it's a turbocharged 1.6 GDI in SE Premium trim, with a manual gearbox. At the first wet roundabout it's also revealed to be front-wheel drive, scrabbling for grip as the 177hp engine roars towards the redline. You might be forgiven for thinking 'well, if you will drive like a prat, that's what you deserve', but this was at fairly tame speeds, merely trying to keep the same pace the Eclipse Cross will carry through the same junction without being rammed by belligerent Peterborough commuters. I honesly thought the Tucson's engine was considerably smaller. If nothing else, this underlines the value of having all-wheel drive. It is available, but only with a diesel, mild-hybrid model costing somewhat more than the Eclipse Cross at £34,945 with leather and panoramic sunroof. 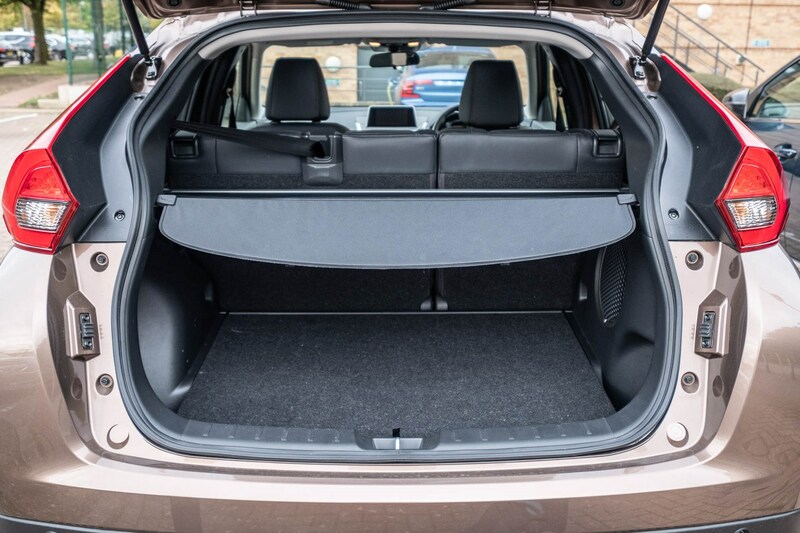 What's frustrating - aside from the limited availability of 4x4 - is that the Tucson is a very solid, very spacious box on wheels to cram some kit into. Interior trim has a few token soft-touch and leather-effect panels but overall feels cheap, yet there are fan-cooled seats and a really good size of opening panoramic roof on the Premium SE. 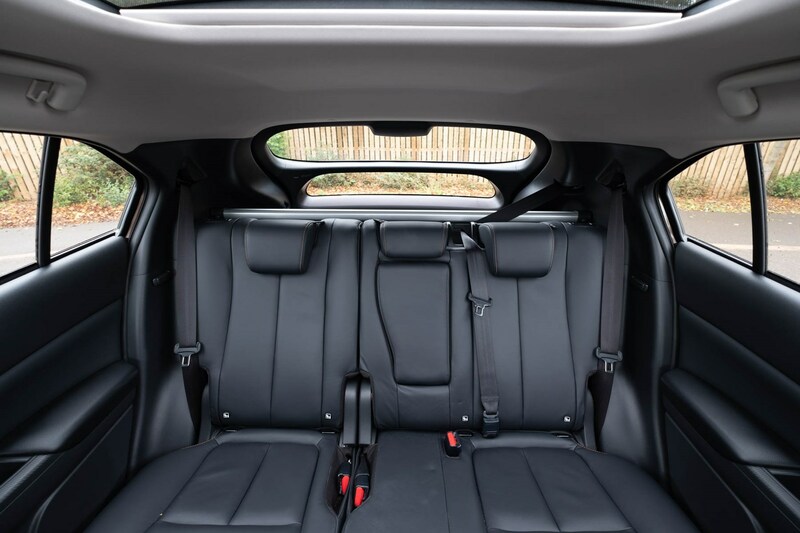 Rear passengers also get heated seats, and there's a load of boot space when compared to the coupe-like Eclipse Cross. Unsettled, uninspiring handling, poor grip and just a general feeling of being less mechanically refined put me off before any of the kit can impress, though. Here's something a little more familiar. I've found Skoda somewhat mixed personally; the Superb Estate is one of my favourite cars (particularly in 280 4x4 form, like our long-term test car in 2017) and on a rational level, it seems hard to imagine a British family needing anything more than the roomy Rapid Spaceback (now replaced by the Scala). Yet Octavias don't really appeal, and much as I liked our long-term Kodiaq, the underlying samey-ness of Volkswagen Group cars does little to inspire an emotional response in me. So the rather basic-looking Karoq faces an uphill struggle against the shiny Eclipse. No sunroof, no automatic, less power and front-wheel drive? Of course, it costs a little less, and a quick glance through the options catalogue reveals a wonderful range to pick from. Tying into the last update, a 10-speaker 550W audio upgrade is just £400, for example. 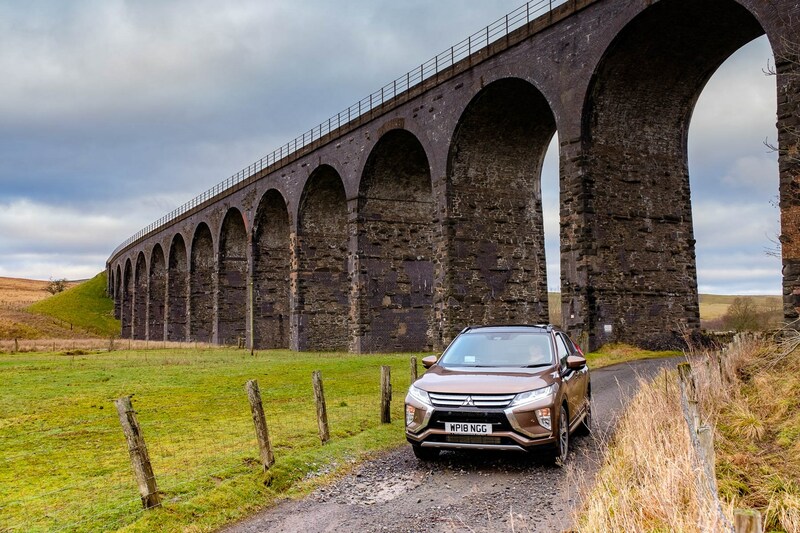 Starting around £26,000, a nicely-equipped two-wheel drive Karoq can be put together for the cost of the Eclipse Cross 4 – without sunroof or leather trim though. If a 4x4 model were necessary, the 2.0 TDI 4x4 is just under £29,000 without options. Basic it may be, particularly in red with stark black bumper trims. The rugged appeal battles with an almost bland lack of detailing, something that the Scala suggests will begin to soften in future Skodas. As the replacement for the characterful (and compact) Yeti, the Karoq feels too serious to me. It's got the solidity to back that up though. Despite slightly less power and fewer driven wheels, it feels swift enough and takes fast bends surprisingly well for such a tall stance of car. There's little trickery here, just the usual stability controls, but there's enough feedback to let the driver have genuine control. 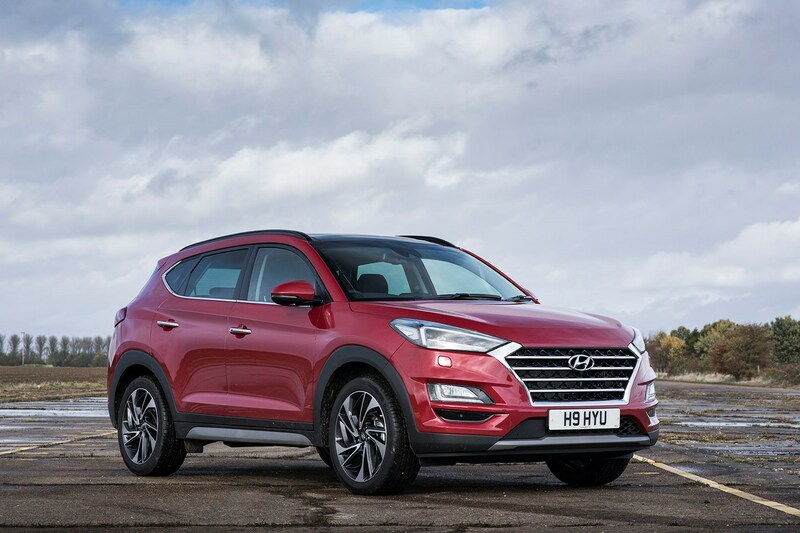 It's a very different experience to the Tucson, which feels anxious and uncontrolled, or the Eclipse Cross with that Lancer-Evo-esque S-AWC style of intervention that allows cornering very much at odds with the attitude of the car's body. A skilled driver can enjoy the Skoda's consistency, yet it's also effortlessly safe for those who just want to get from A-to-B. 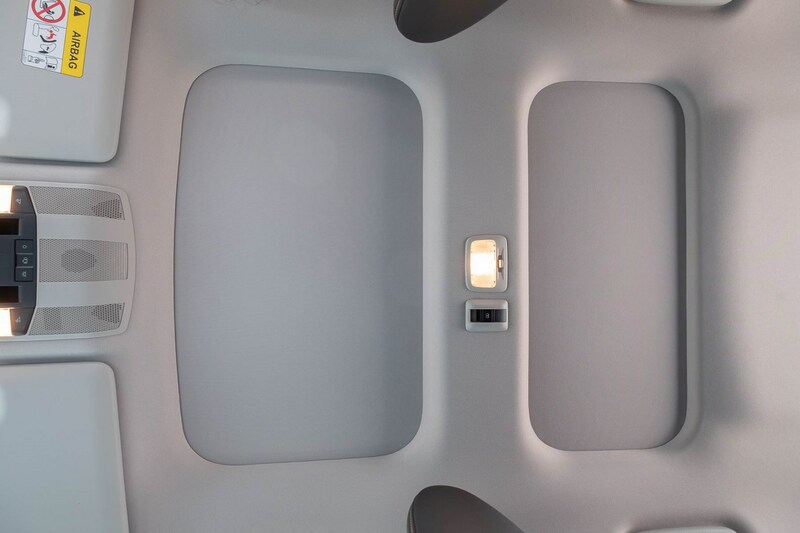 Supportive fabric trimmed seats keep the theme of common-sense austerity. Refreshingly free of any veneer of exclusivity, the underlying quality of the plastics and trim in the Karoq shines through. Would you rather have a shoddily-constructed chrome-trimmed switch, or some plastic that will last until world ends that fits perfectly? Huge boot space, decent rear legroom and great forward visibility go a long way to making the Karoq feel deeply rational and sensible too. 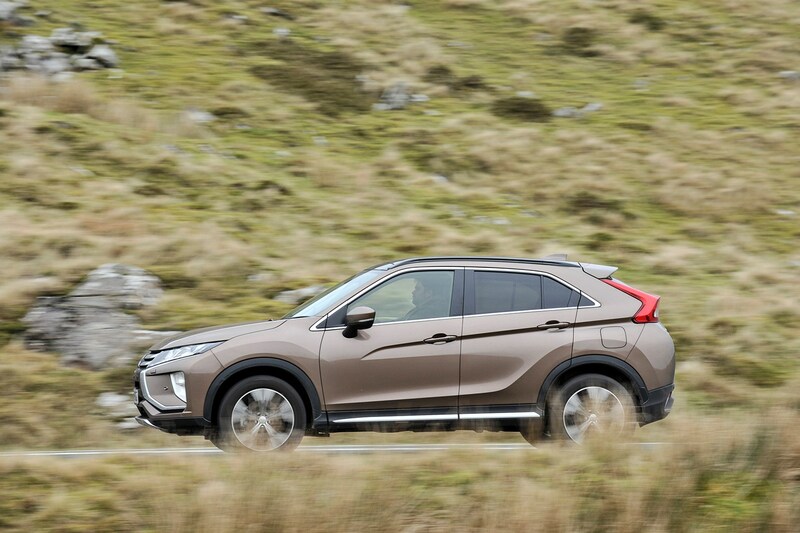 Performance is adequate from the 150hp 1.5-litre engine, economy is comparable to the Eclipse Cross at motorway speeds, and slightly better in town. Since I don't need the much larger bootspace of the Skoda Karoq or Hyundai Tucson, the Eclipse Cross is still a clear winner for me. It's more visually interesting inside and out, and although it could use more power overall, it uses the power it does have extremely well. If the Karoq were equipped to the same level as the Eclipse Cross, it would be a much more expensive choice. I really appreciate having all-wheel drive at a sensible price, though, and if the space were a priority the Karoq impresses with a mature feel and quality over glitz approach to the dashboard and trim. Between the Karoq and the Tucson, there's just no contest. The Skoda is fundamentally the better machine in my opinion, and no amount of distracting kit and leather-wrapped trim can divert attention from the inferior experience behind the wheel of the Hyundai. Some things seem pretty straightforward; most of the time we have a long-term test car for a duration shorter than the service interval, and on the rare occasions they need a service during their tenure at Parkers, we get them booked in with time to spare. 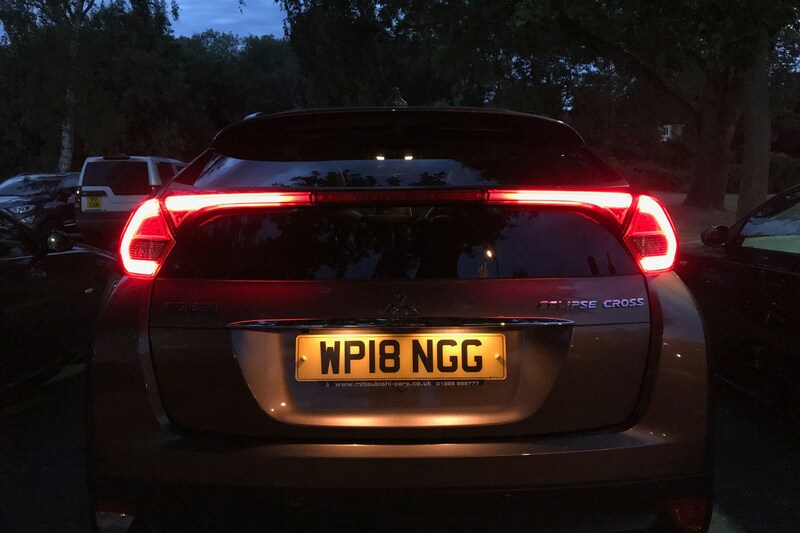 The Eclipse Cross has hit that interval sooner than anyone expected, and worryingly close to the time it should return to Mitsubishi – right as Christmas holidays approach. Coincidentally, it's also as I finally got around to taking my own car – the Fiat Fullback LX – for its first service. Events that combine rather neatly, as Fiat want a staggering £408 to change the oil and filters on my Mitsubishi-built pickup. 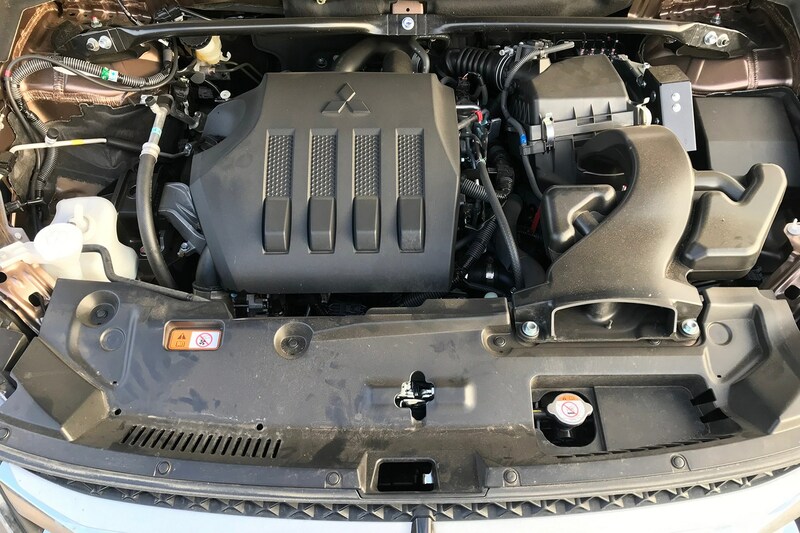 Naturally once I'd recovered from the shock, I called Close Mitsubishi in Peterborough and enquired about the cost from the manufacturer's network rather than the brand on the grille... a more reasonable £255, which includes checking the transmission and differential oil levels as well. Quite why Fiat need an extra hour of labour to accomplish this is beyond me. During the Fiat's service, it was pointed out that a couple of recalls were due on my Eclipse Cross, so it was arranged to bring it in the following day. As it happened, the distance remaining before the next service meant the dealer recommended getting that done as well, meaning I'd be able to use the Mitsubishi over the holiday period, and they slotted it in to their existing workflow with a lift back to the office. Impressive service, and though the dealer's aware that this is a press test car, some time spent chatting to other customers getting services and recalls applied suggests it's the norm for the Peterborough branch. 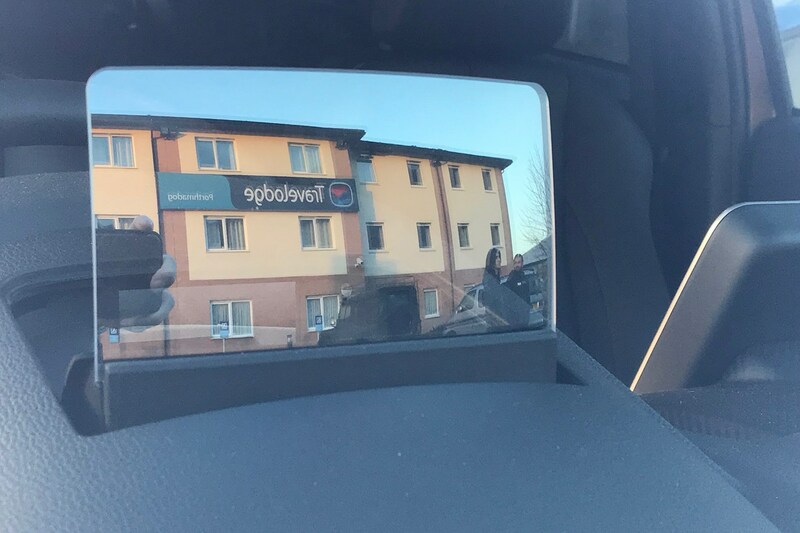 With a convenient service to be dropped off at work and collected, there was even an opportunity to experience an Eclipse Cross from the passenger seat, albeit a manual-transmisison 3 specification. It seems the six-speed gearbox gives equally relaxed cruising at motorway speeds, and the fabric interior feels pleasant, particularly where the matrial on the doors provides more tactile contrast than the plastic to probably artificial leather on the higher-spec car. 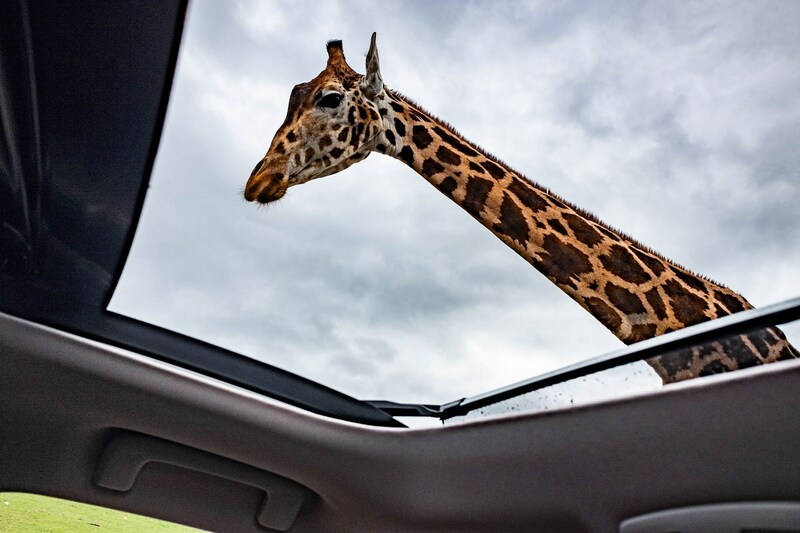 It's odd not having the sunroof, mind. The first-service rate of £207.18 inc. VAT is largely made of the hourly £84.95 ex. 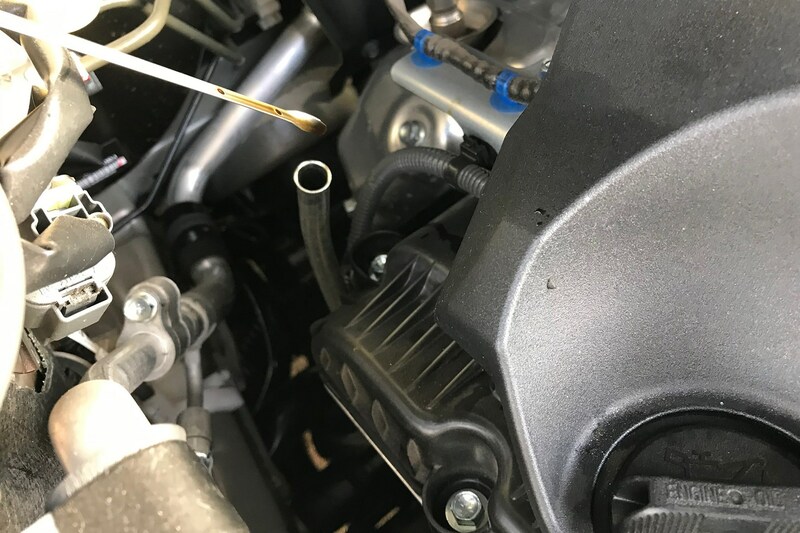 VAT labour rate, at 1.2 hours to change the oil and filters, check the differentials, lubricate the propshaft and so forth; it's reasonable for a four-wheel drive car, though the appeal of prepaid servicing increases when you consider the next service will involve more work. There's no charge for the recall, but for other, chargable firmware updates to the car systems it seems to take around 20 minutes. The attitude of the dealer may affect the cost of such updates dramatically; I've experienced overpriced minimum hourly rate charges for updates to critical systems (thankyou, Citroen) and free-of-charge upgrades to infotainment systems (courtesy of Mazda) alike. In the meantime, though the recall should calm down the erroneous BRAKE! messages when driving past parked cars and shadows, and apparently reduce the noise made under autonomous emergency braking, it seems to have had the opposite effect in certain situations. Attempting to overtake a slow vehicle in 50mph average cameras not only resulted in the Eclipse holding well below 50 in the outside lane despite no vehicle in front, when pushed forward the displays protested with the aforementioned warning - apparently for the large van alongside! 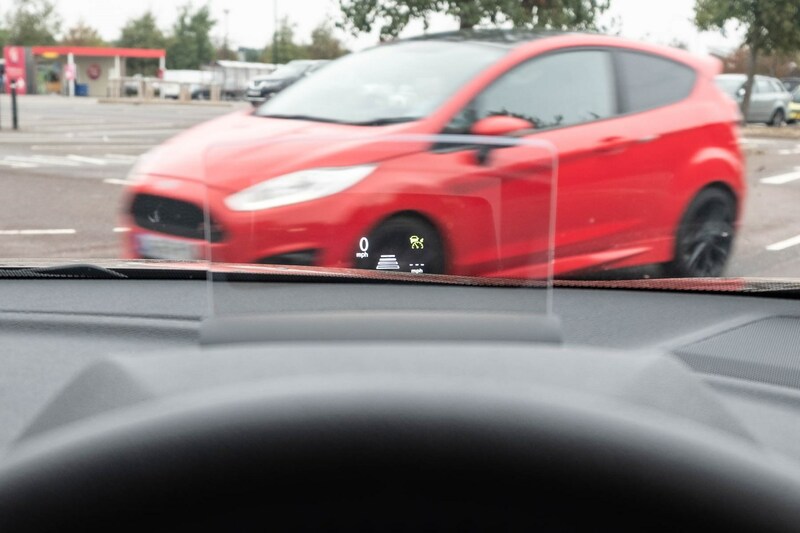 Adaptive cruise does seem smoother and better at tracking cars as they slow down. It's a little slow to pick up the pace afterwards, and not just in Eco mode, but the slightly jerky progress when using the throttle and adaptive cruise is reduced, making overriding the speed more comfortable. After the service it seems that the ECU has recalibrated, too - with the Eclipse Cross feeling a little quicker off the line. That'll probably revert to my style after a few journeys. Service indicator reset and a small break for Christmas and New Year gives a rare opportunity for the Eclipse Cross to break-out of the daily commute. The destinations? That little cluster of towns around the Scottish Borders area of Roxburghshire, namely Kelso, Hawick and Galashiels, followed by a trip to South Yorkshire afterwards. It's necessary to escape the delights of the West Midlands first, though, so an interminable amount of M42 and M6 has to be tackled. This is probably the longest time Rachel has been in the Eclipse's passenger seat. and with relatively few adjustments discomfort seems likely. As we pass Tebay services, however, there are still no complaints, and a fair amount of praise for the heated chairs. From the driver's seat, it's as comfortable as ever. Again, spoiled by multi-adjustable massaging chairs in even mid-range Mercedes-Benz, Volvo and Peugeot models the Mitsubishi seats could come in for some crticicism, but for this kind of driving, they're surprisingly good. It could be luck that they fit me well, but having found many cars cause some discomfort when other drivers have been content, it seems fair to conclude that Mitsubishi got the seats fundamentally right, and thus don't need to include a lot of adjustable parts. Getting into the Borders, there's a revalation - suddenly, after months of seeing barely any Eclipse Crosses in the wild, they're everywhere. Driving through the first village I lived in there, there's a silver one just a couple of houses up from my old cottage, parked in 'my' spot. As we progress from Stichill, past Smailholm and then down towards Gattonside in search of the popular viewpoint of Scott's View, where you can see the beauty of the Eildon Hills, another couple are spotted wandering around. Our Eclipse gets to tackle the narrow twisty road up towards Bemersyde relatively unbothered by other traffic - the weekend before Christmas is a quiet time. It's a car that fits this environment well, particularly in this colour. Around the roads that inspired drivers like Louise Aitken-Walker and Jim Clark the long-travel suspension and sporty attitude of the body, recalling the last sporting Mitsubishi Lancers offered in the UK (the Ralliart-tuned Sportback echoed in the roofline, the Evo X commemorated in that clever split rear glass), tempts more entertaining driving without risking discomfort. Unlike the smooth motorways and elongated A-roads of England's midlands, though, the chaotic, volcanic landscape of the region play against the 1.5-litre turbo and CVT gearbox; any attempt to be really engaged with the road results in a rather fussy battle between torque, time and turning. Build speed towards a bend, lift off and it all gets a bit disjointed when you want the power back, and in these situations you're reminded of the weight of the Eclipse, and relative lack of power. It's so well-masked in less difficult environments that it comes as a shock, and to be fair to the Mitsubishi any bulky, automatic, small-engined car will face the same realities of physics. Time for a change in attitude behind the wheel after some time taking in the landscapes where Thomas the Rhymer was taken by the Queen of Elfland. A long way from shopping centres built around Poundland and the ribbons of grey motorways tying the midlands together; there's a magical quality to this area. It's not a bad place to contemplate a change of pace, though there's a lack of storage places in the cabin to hide snacks. Getting around slowly plays to the inherent smoothness of the engine and CVT gearbox, and for the time being the B6397 and A7 are calm places to be, as we leave Walter Scott's favourite contemplation location and head to the newly-reconnected Galashiels, where the old Waverley Route from Edinburgh to Carlisle has made a resurgence. A lap of the town shows how things have been affected by a large retail park; since moving away from the Borders a decade ago some aspects have been utterly transformed, yet the pavement around old haunts looks exactly the same. It's an odd feeling indeed. Galashiels has been through a few turbulent periods and seeing so much of town centre closed, with shops as vacant as the stares from unemployed teenagers sitting around Bank Street gardens is, frankly, disheartening. A whole strip of 1960s-looking units lie empty bar a betting shop or two, and big brand stores on the pedestrianised Market Square are closed, but not absent - relocated to the cold expanse of retail – dominated by Tesco and Asda, curiously accessed though the still-shoogly potholed remnants of Paton Street; the college halls are further out, and there's nowhere to dance, dreich rain instead of snow, but the Cherry Blossoms have been replaced. 2019 may well be promising, though, as not only is the Borders Railway thriving after opening in 2015 with a rather impressive transport interchange encouraging more activity on the opposite site of Gala Water, the centre of the town will be hosting The Scottish Tapestry (or The Great Tapestry of Scotland) and it seems likely that the same improvements such as arts and crafts, artisan food & drink and local entertainment that have helped Kelso remain appealing to tourists and visitors - despite a lack of rail connection - will follow. Galashiels is a short stop, however, as I've planned to show Rachel the wilder areas of the Borders that are closer to my heart. 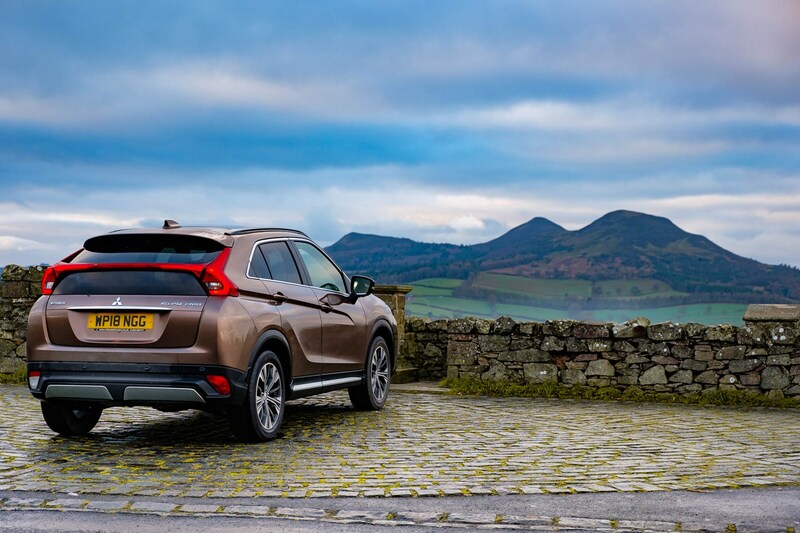 It's not exactly the weather for exploring, so the Eclipse Cross seats are going to be a handy perch from which to witness the expansive, occasionally harsh landscape of the Cheviots south of Hawick. Like Galashiels, Hawick's fortunes after the 2008 crash seem to have been somewhat mixed; the tail-end of Blair-era optimism taking shape as the Heart of Hawick, an ambitious regeneration of Victorian industrial centres that fell into dereliction. Key to this is the former Corn Exchange, a place that I remember more by reputation as Bogart's nightclub, which burned down the year I started college there (unrelatedly, I assure you). Joining this is the impressive Tower Mill, housing a 14-foot waterwheel in the path of the Slitrig water. Opening in 2007, the Heart of Hawick brought arts and cosmopolitan cafes and connectivity to one of the Borders' most remote large towns, but as we drive down the High Street and see crucial locations like Sonny Murray's Uni-Parts (Hawick, like China, has a cavalier attitude to trademark infringement) store still whitewashed and shuttered years later, it's hard to find much to be enthusiastic about having come from the area. Teries may hold fast the concept of 'aye bin', that things don't change and have always been that way, but as the 19th-century pomposity of the town hall and overall architecture broadcast, this town once had the highest per capita income in Britain. Things do change, apart from a general suspicion (okay, deeply held hatred sometimes) of folk from Galashiels and Kelso, and Hawick's illustration of postwar entropy is almost heartbreaking. It's still worth visiting and in some ways, still feels like home, albeit a rather shabby reflection. We drive past the Heart of Hawick, past the quiet - hopefully, for seasonal reasons - factories of Lyle & Scott and follow the aforementioned Slitrig water out towards Newcastleton on the B6399. For many this route is just an alternative to the fast-flowing, single-carriageway A7 that serves as the major trunk route from Carlisle to Edinburgh. In Hawick, though, it's a reminder of just how little the rest of Britain cares for areas bordering two 'countries' as it were; when Beeching swung a metaphorical axe fuelled by Ernest Marples' self-serving thirst for motorways, the North East lost hundreds of miles of railway with no prospect of investment in transport. Edinburgh, Galashiels and Tweedbank may be reconnected, but with much of the trackbed lost connecting other towns, it seems that continuing to Carlisle is going to be an expensive, and unlikely, task. Hawick's railway line, a lonely place through this desolate landscape, can still be seen boldly cutting through the countryside. 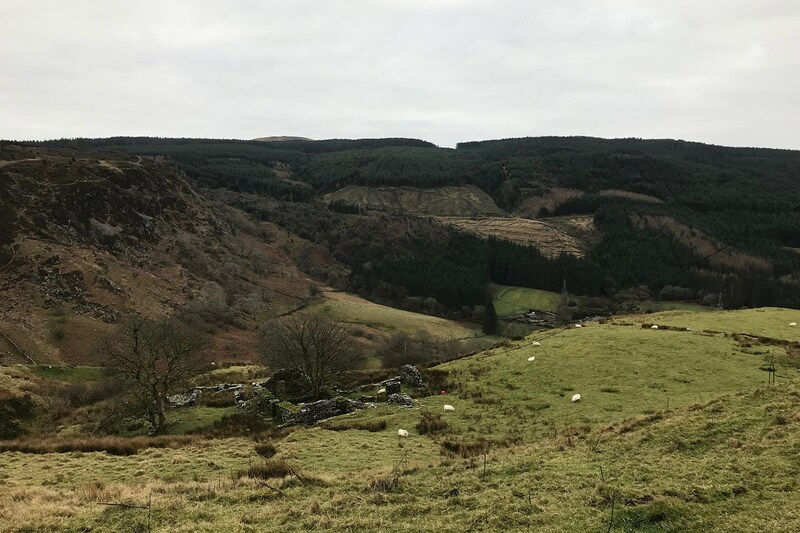 It's easiest to pick up at Stobs Camp, a former military camp used later for prisoners of war, spotted by the still-standing gatehouse of Stobs Lodge. It crosses private land here, but can be picked up and walked down until you reach Shankend Viaduct. We drove, of course, and a fuzzy memory of which viaducts and bridges are where ensured Rachel was subjected to a rather bumpier track than anticipated as we turned off towards the handful of houses nearby. 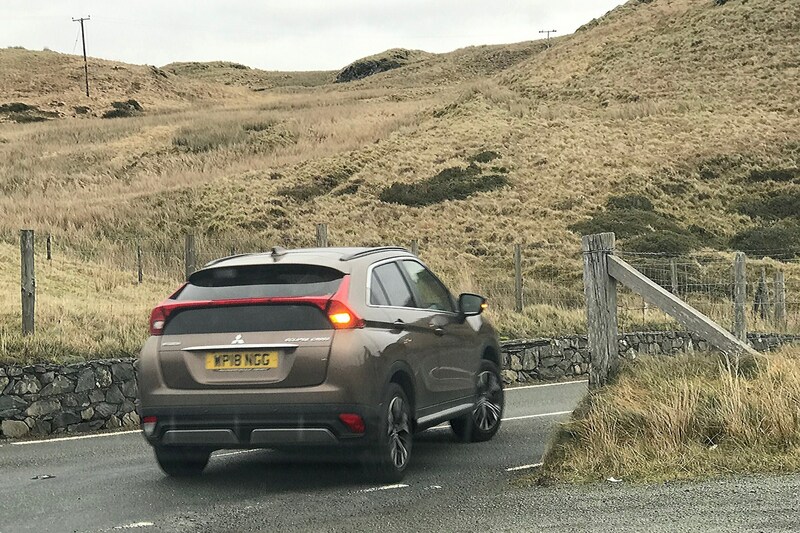 The Eclipse Cross has no issue with this stretch of road, happly bouncing over the ruts and effortlessly pulling out of a muddy verge after turning around. Hardly challenging, but again, showing how much sense a crossover makes for rural areas like this compared to a family hatchback or a cruder, more purposeful 4x4. 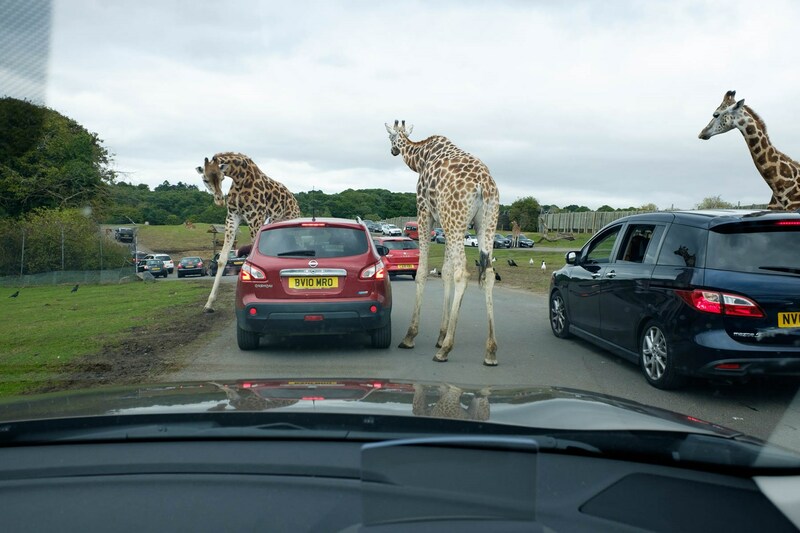 When exploring these areas as a local, it was from behind the wheel of a Land Rover 109-inch van or a couple of soft-top Suzuki Vitaras; the idea of then driving these to the midlands is pretty frightening now. If you continue down the route with your eyes to the right, you see the track reaching Whitrope Tunnel (we'd recommend keeping your eyes on the road, though, as it's a little twisty) and then the Waverley Route Heritage Association visitor centre of Whitrope Siding, which it's reassuring to see has acquired some rolling stock. How does the Eclipse Cross handle B-roads? Rolling stock seems apt, as these roads were once tackled with confidence in things like a Mazda RX8 or Subaru Legacy 4Cam Turbo. S-AWC or not, the Eclipse's tall stance, soft suspension and feedback from Rachel brought speeds down very rapidly, but even then there's a difficulty in balancing progress and comfort. At 20-35mph around moderate bends, the Mitsubishi takes a while to resettle and in a series of turns, the lack of side bolsters on the seats becomes apparent too. It's not bad, but it slows you down a lot if you've got other people in the car to consider. 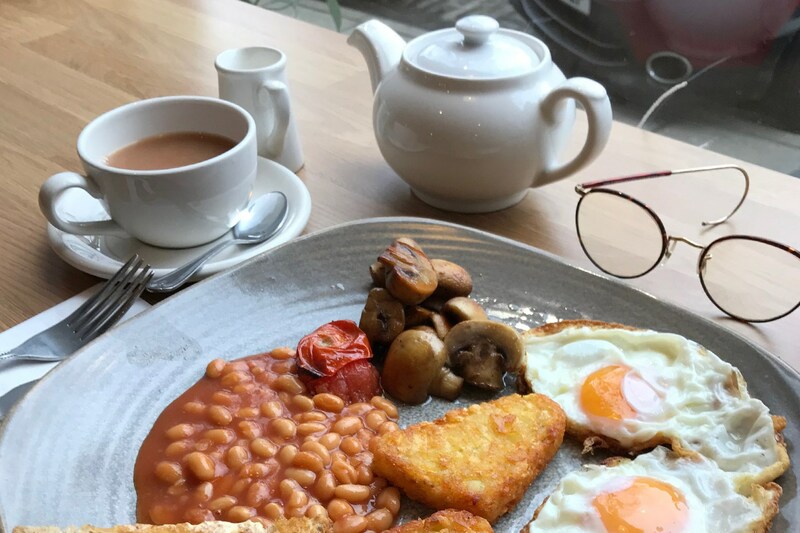 Rather curiously, Rachel's comments on the road and handling were at odds with my own experience, but she found my yelps of frustration at unexpected bumps and lumps in the road inexplicable. The conclusion is that the Eclipse Cross does an oddly good job of isolating harsh road surfaces, but they're felt on the side where they are, rather than the whole-car thud many vehicles create. Feel it through the seats, feel it through the wheel, but not, it seems, through the body. With a strong mist rolling in, the dashboard pings up an urgent need for fuel. We'd driven through Hawick just a few miles back, having been told of a new petrol station in Newcastleton, with a range of 50 miles; the hard work of slow corners and hills had slashed that range. We faced a rather tense drive for a while, and passed by Hermitage Castle. For fans of ghost stories, the remains of the Waverley line from Whitrope continue to Riccarton Junction. There was no time to visit this time, but I know from experience that the Mitsubishi would have no issue with the forestry service road that leads to the abandoned town; once home to 30 households and about 119 people, the town existed purely because of the railway and had no road access, despite having a school and post office. Beeching's cuts literally cut the location off, but you can stand on the remains of the platform and on a misty day, imagine waiting there for your only escape route. As the afternoon wore on, and the charms of sitting in the passenger seat of the Eclipse wore off with five hours still to go to Birmingham, we paused to admire low clouds and mist; Newcastleton just a couple of miles away. 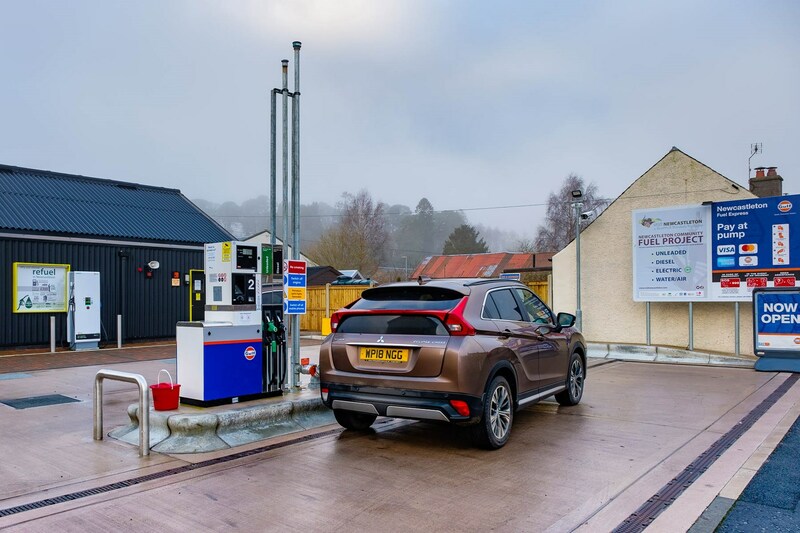 When we reached the small town near Northumberland, the petrol station turned out to be a self-serve type, community funded and reasonably priced. 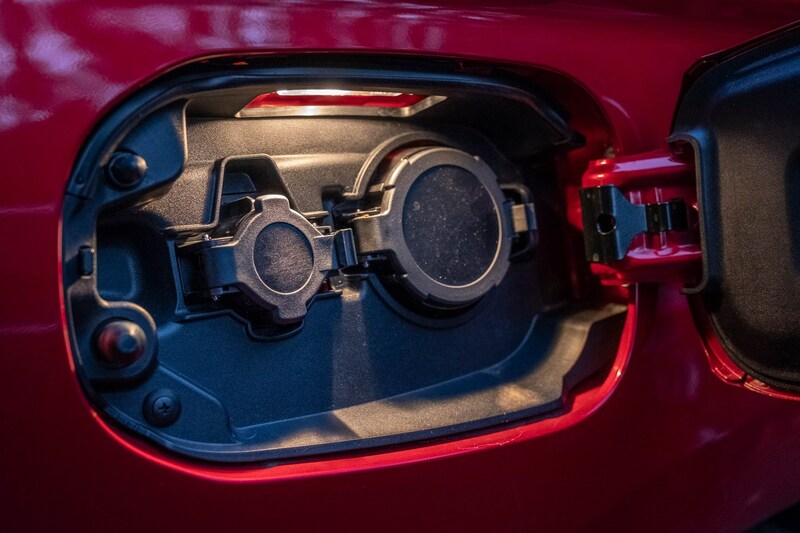 There's also an electric charging point, which makes a great deal of sense for cars like the Nissan Leaf or Renault Zoe, which would easily handle the 20-mile trips to supermarkets without emissions in a way that conventional cars can't. Giving the Eclipse Cross some more challenging roads, more occupants and a fair amount of hill-climbing did hit the economy quite hard, with this trip registering 31.7mpg overall. A lot of that is ironically down to the slow progress through the B6399 from Hawick to Canonbie, where many turns, climbs, stops to look at scenery and a general need to keep varying speed keep the CVT gearbox away from that happy optimal gearing. You could do better but progress would feel glacial, or you could go faster and have very unhappy passengers; it's all a compromise – much like the car itself.